To begin with you have to understand that the ~800 mile long Hayduke trail is not a trail as most people think about long trails. It is really just a “corridor” with a route identified, on paper, through it. First pieced together by Mitchell and Coronella in the late 90’s and then described in their book The Hayduke Trail in 2005, sometimes it is on actual trails, sometimes on dirt roads, most times it is cross country following canyon bottoms, cattle trails or nothing at all. 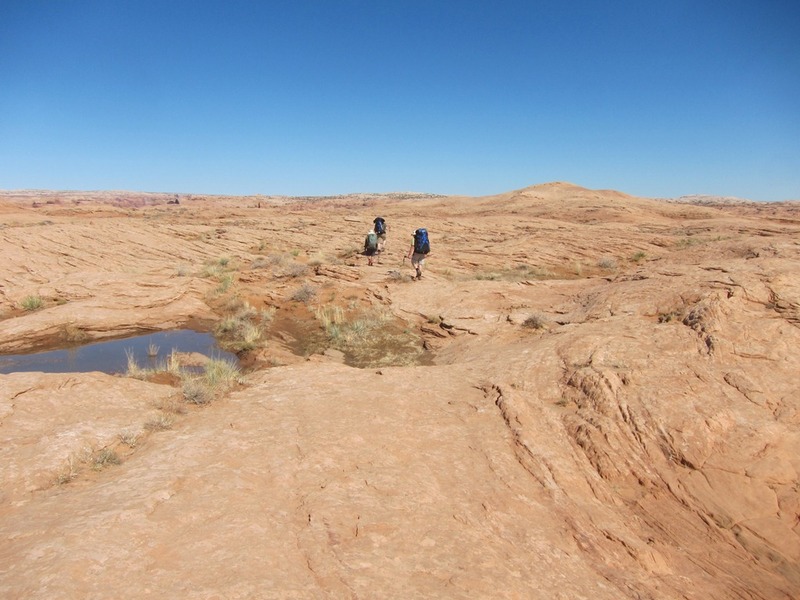 The few people who have actually through hiked it have not done it completely by the route described in the book. Our route would also be unique and deviate from the book route in several places. Lee contacted me in early April asking if I was interested in doing a long section of the trail in the fall. My immediate reaction was I couldn’t be gone for a month or more and dismissed the idea, but Betsy said I should do it as I had always talked about what a great walk it would be. 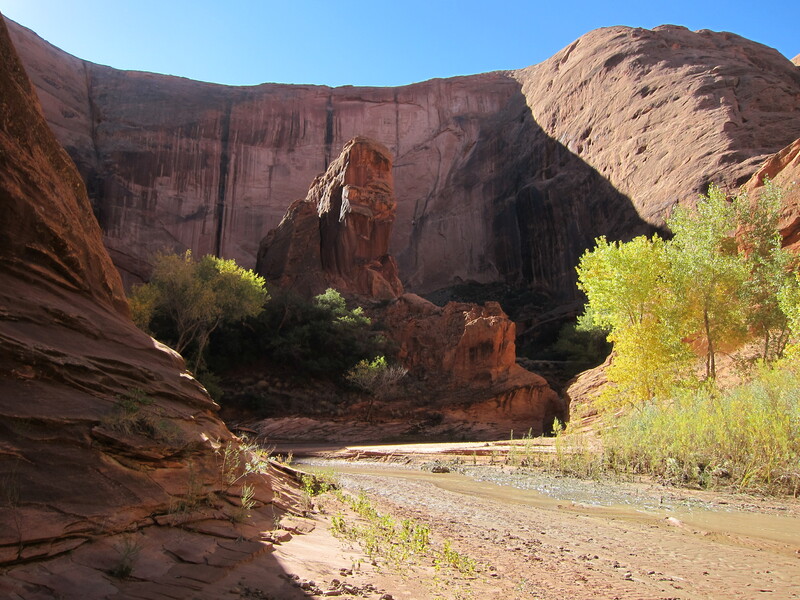 Having already done most of the Zion sections, been down in the Grand Canyon and to Bryce multiple times and walked the lower and upper Paria River and Hackberry canyon parts we decided that the eastern half, or so, was what we wanted to do most. This would be the longest and most difficult trip I had ever attempted and is logistically intense in difficulty of access, water availability and food resupply. 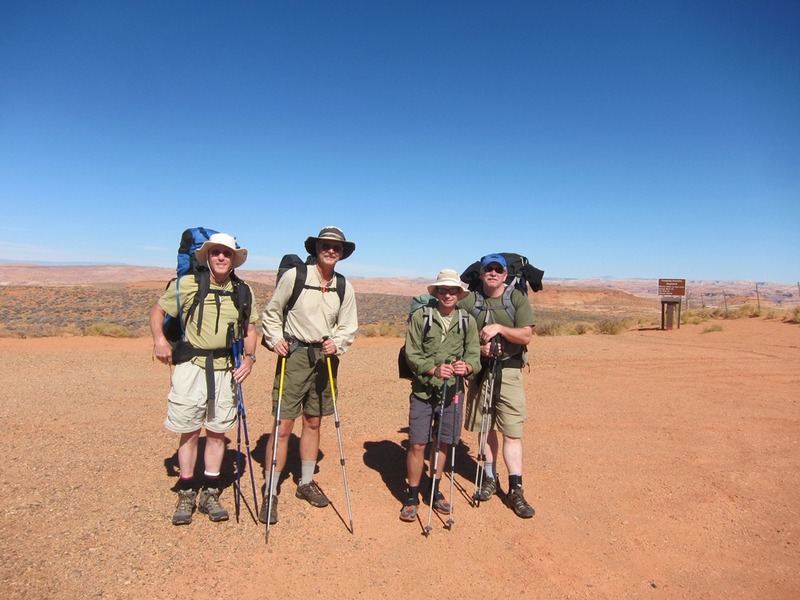 Research ensued and slowly through the summer a 25 day plan evolved with four parts (covering the guidebook sections 1 to 6) including three resupply points and 340 miles of walking. We would cross a paved road only three times with the closest towns being 17 miles away on the 11th day (Hanksville), Hite Marina on Lake Powell the 13th day (not a town but a NPS facility with a small convenience store, closest towns Hanksville, 50 miles or Blanding 80 miles) and Canyonlands Nat. 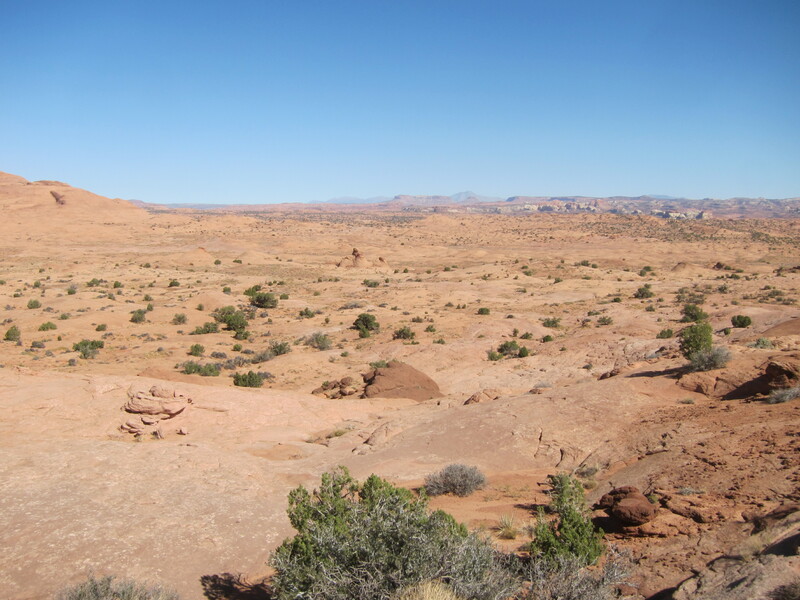 Park on the 19th day with Moab being 70 miles by road. It is over 300 miles from the nearest large airport on either end. Planning and preparation notes here. 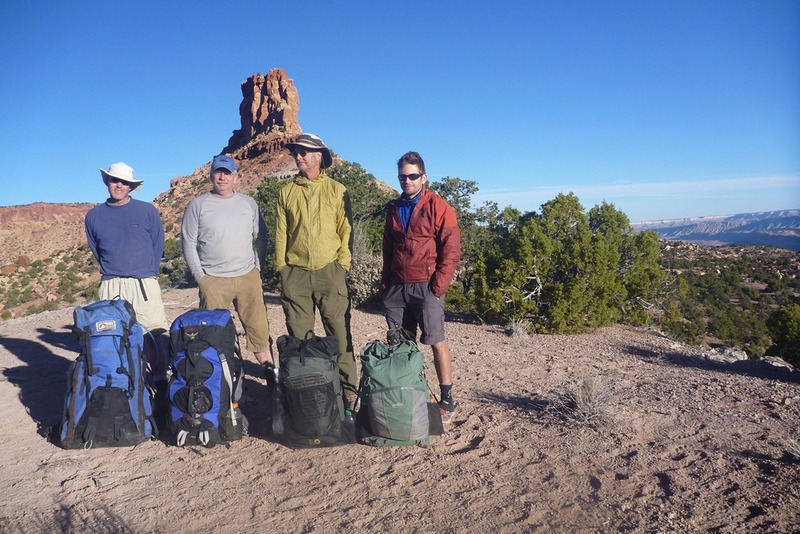 Scott and a friend John would join us the first week to mark Scott’s 50th birthday year which would ease us into the longer trip, help with the first resupply point and the final car shuttle. 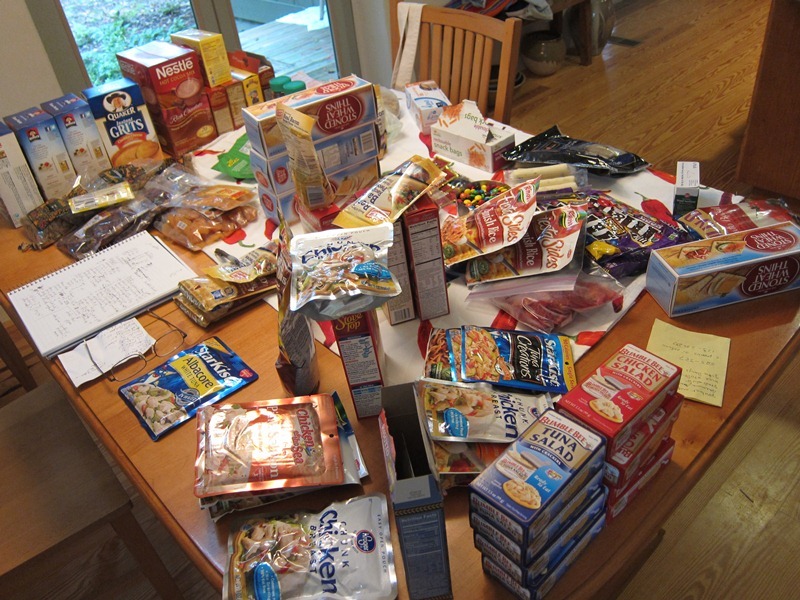 I assembled my resupply boxes and mailed the ones for the 3rd and 4th parts to Lee, who lives in northern Utah. Lee then had to combine both of our supplies and mailed one to Hite and the other he cached in a bucket outside of Canyonlands NP the day we were flying in. 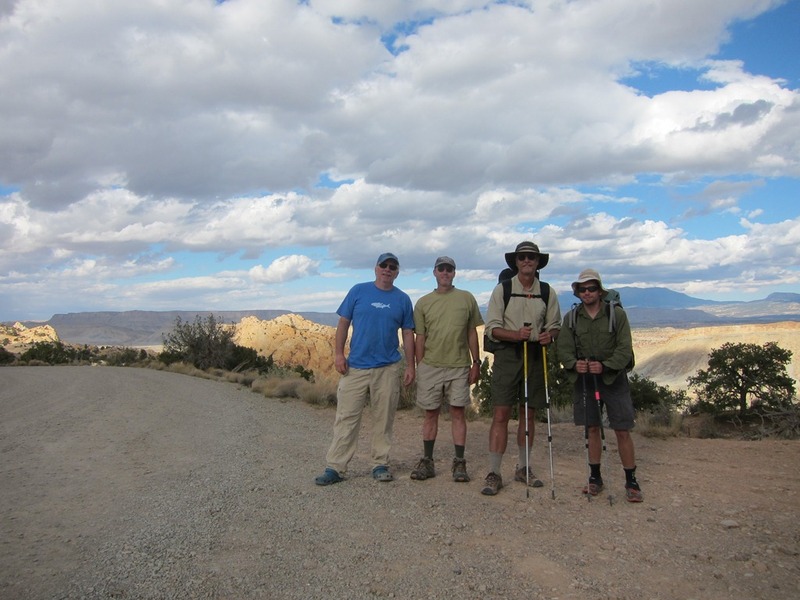 John flew in from Kentucky, meeting Scott and me in Salt Lake City where we rented a car and rendezvoused in Escalante with Lee on the night of the 14th. 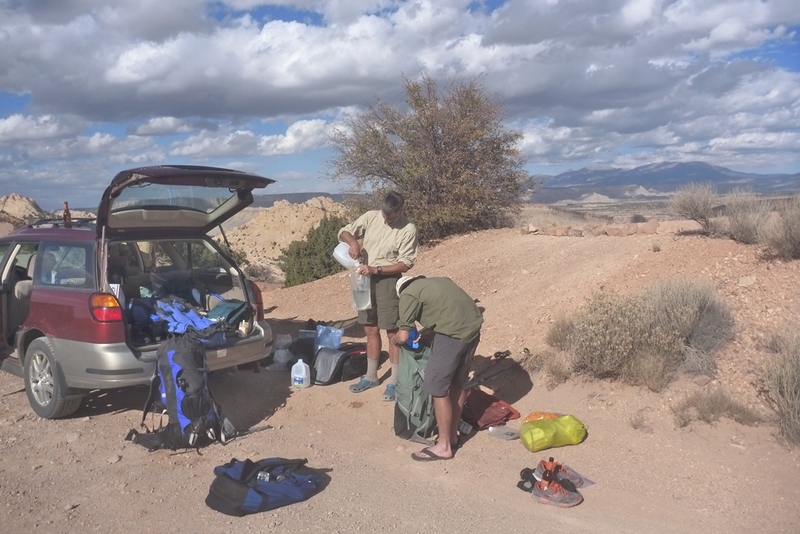 Early in the morning of the 15th, we began the four hour car shuttle, leaving one car at the Lower Muley Twist canyon trailhead on the Burr Trail in Capital Reef Nat. Park that would hold our resupply for the second part and allow Scott and John to return to civilization at the end of the first week. We then finished with a 40 mile drive down the dirt Hole-in-the-rock Road to the Jacob Hamblin Arch trailhead on the 40 Mile Ridge road. 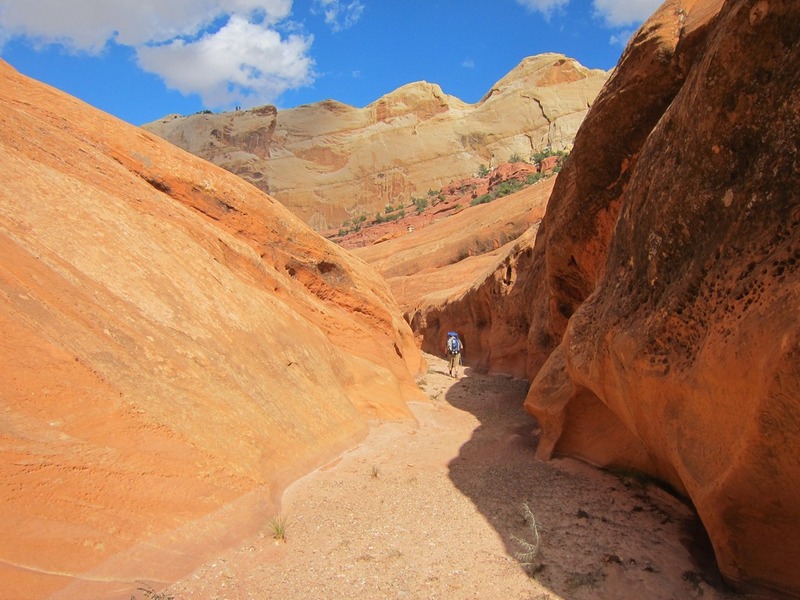 Finally on the trail by 12:30 we started by walking the rest of the sandy road out to the Crack in the Wall trailhead where there were eight vehicles, Coyote Gulch is one of the most popular places in all of the Grand Staircase-Escalante region. 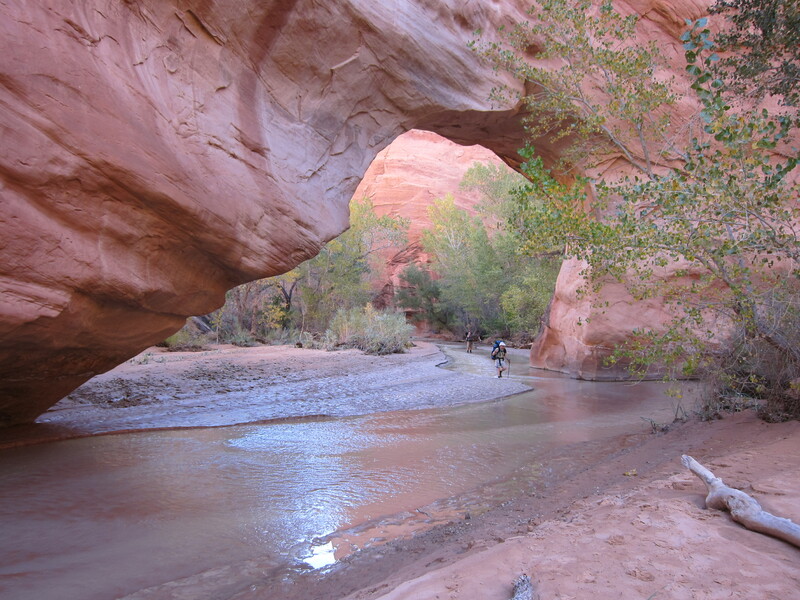 This would be our first diversion from the Hayduke route which goes down Coyote Gulch and then up the Escalante river for 25 miles. 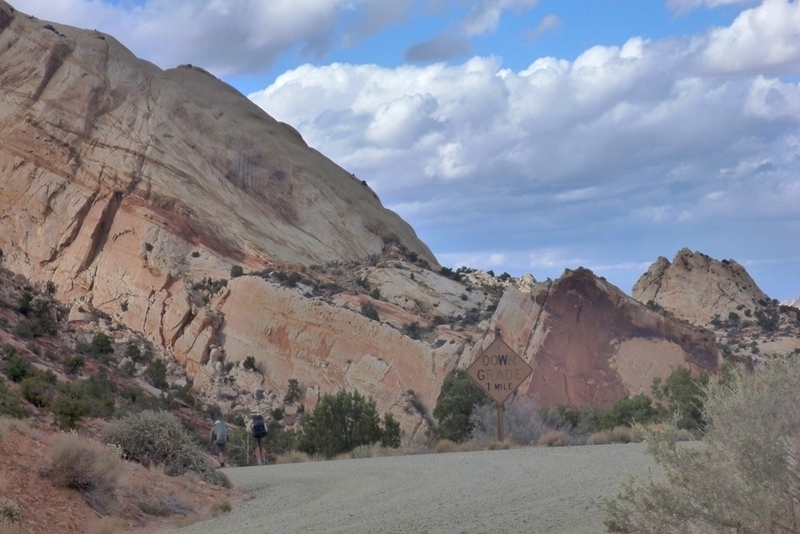 Many reports had indicated that the ~20 mile section of the Escalante from Coyote to Scorpion Gulch was so arduous that people ended up hating it. 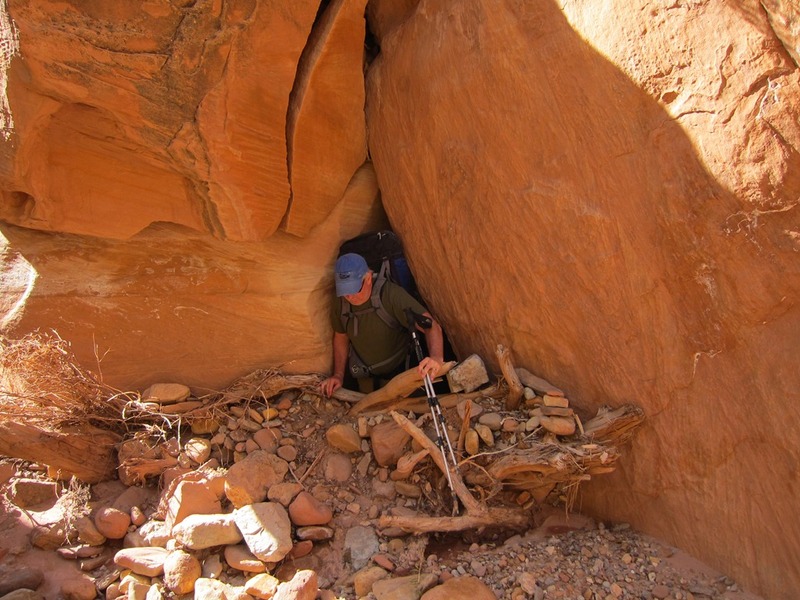 So we decided to drop down into Coyote Gulch, at its confluence with the Escalante, via the dramatic Crack in the Wall route, walk up stream to take in amazing Coyote Gulch and then cross over Scorpion Mesa and go down Scorpion Gulch back to the Escalante and rejoin the Hayduke route there. 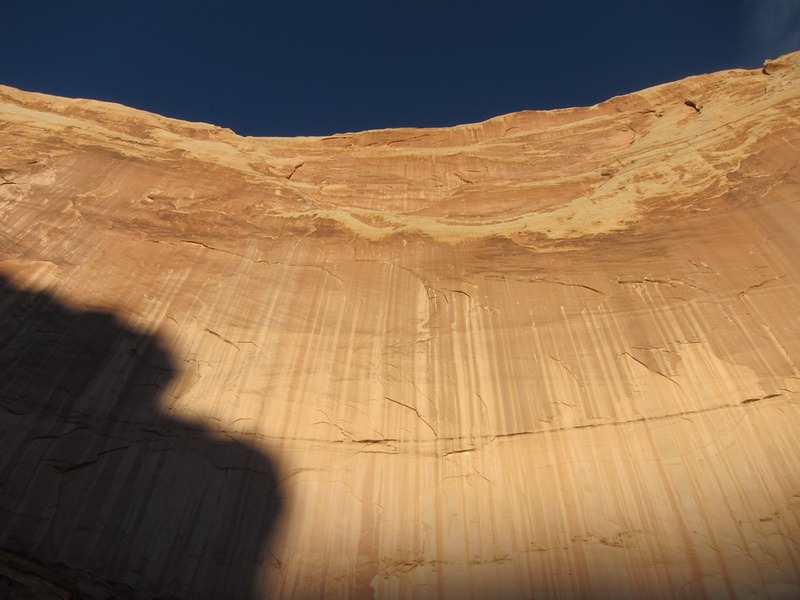 The Crack in the Wall route goes out over the slickrock to the very edge of the Navajo sandstone cliffs that are the rim of the canyon of the Escalante river. 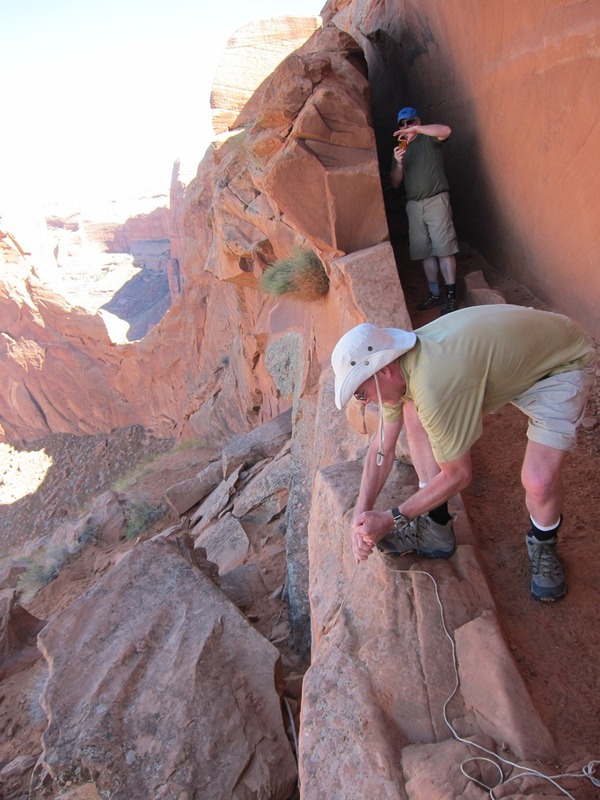 The “Crack” is actually three big flakes of sandstone pulling away or leaning out from the cliff face. 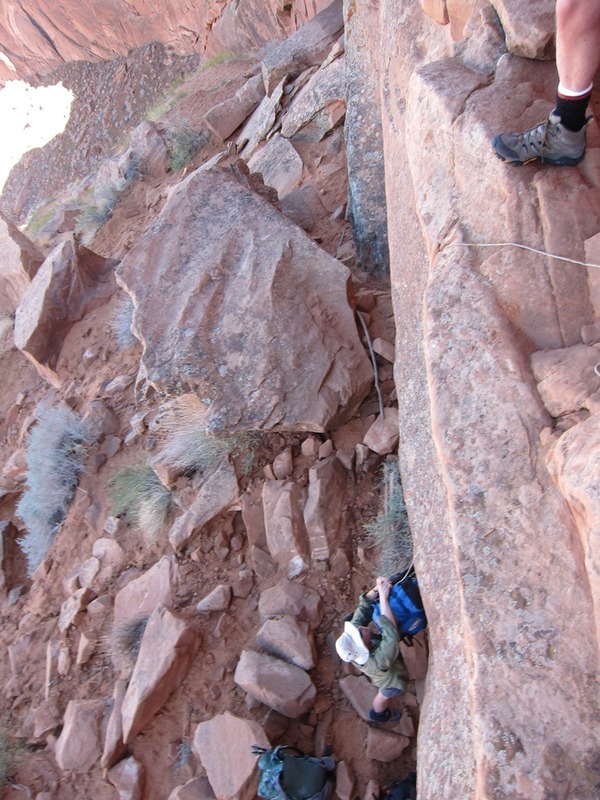 The first section is a step down where we handed packs down. 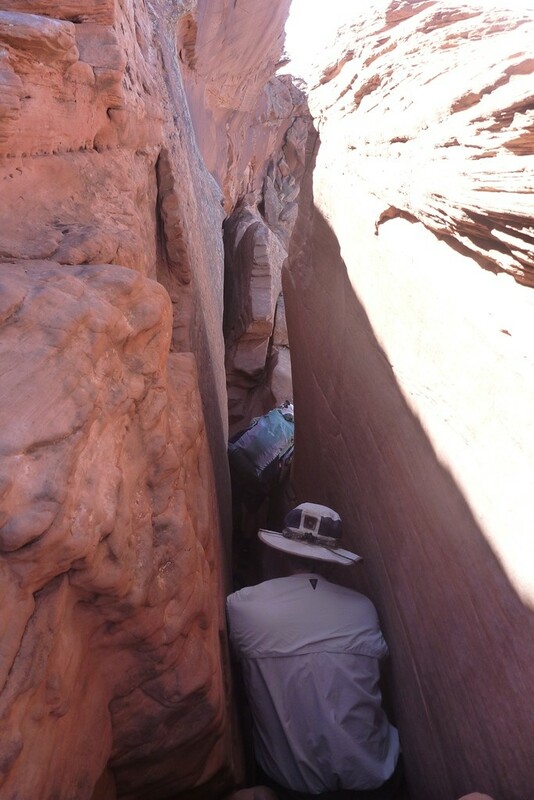 Then one hauls/drags the packs through the second section where we then lowered them down 20 feet so we could shimmy through the third and narrowest section. 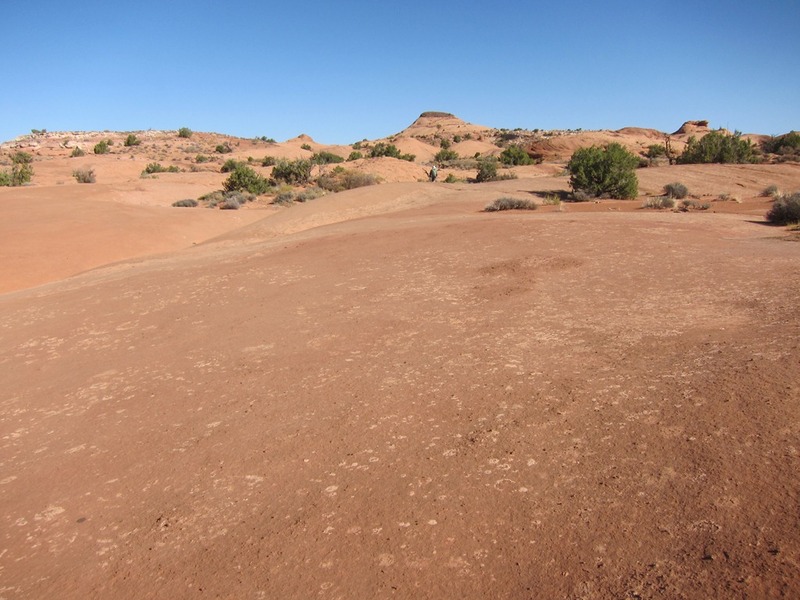 You now are at the top of a giant sand dune and it is really not a very big drop from the top of the cliffs. 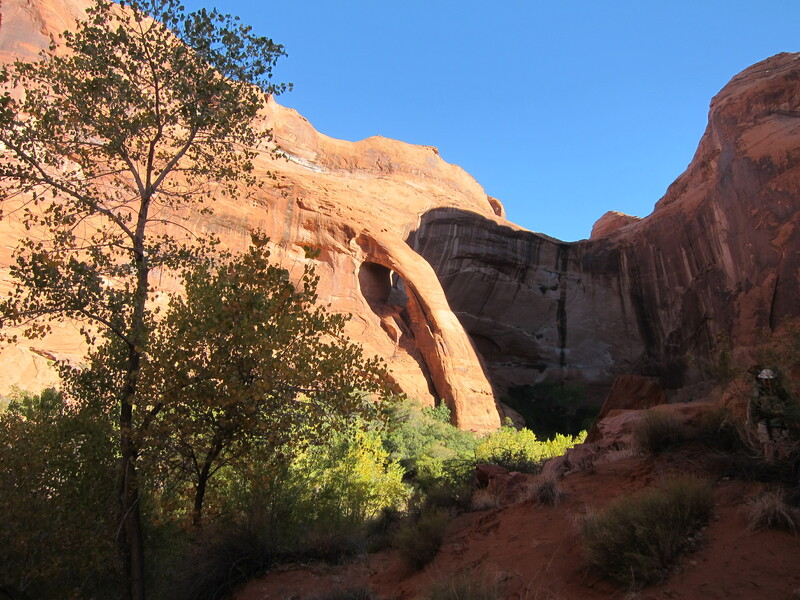 An easy walk down the dune to the creek bed of Coyote Gulch with giant views of big walls and Stevens Arch. A big storm had passed through the area four days earlier and the river gauge had jumped up and down several feet. 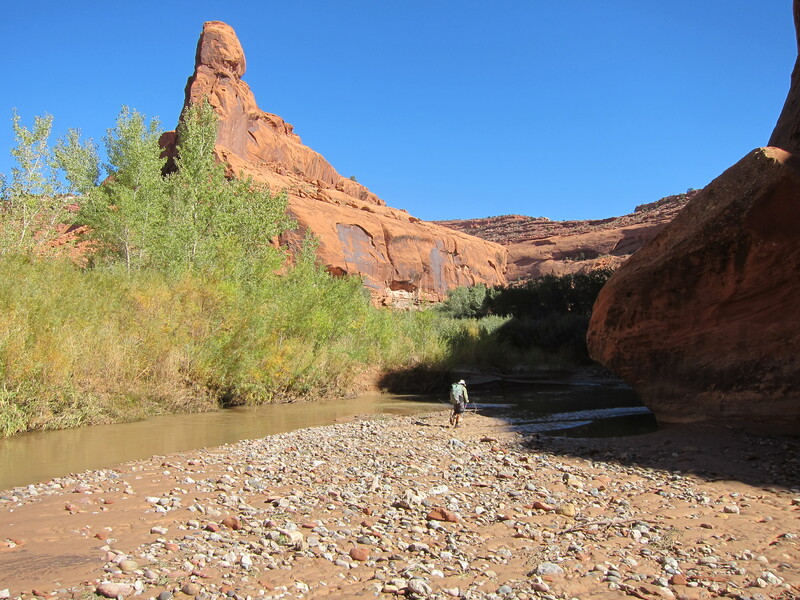 It was apparent that Coyote Gulch had flashed too with a thin slippery layer of blue gray silt on everything, the water very milky and even quick sand in places. Still beautiful but it would make walking up the canyon more difficult and tedious than it normally would be. 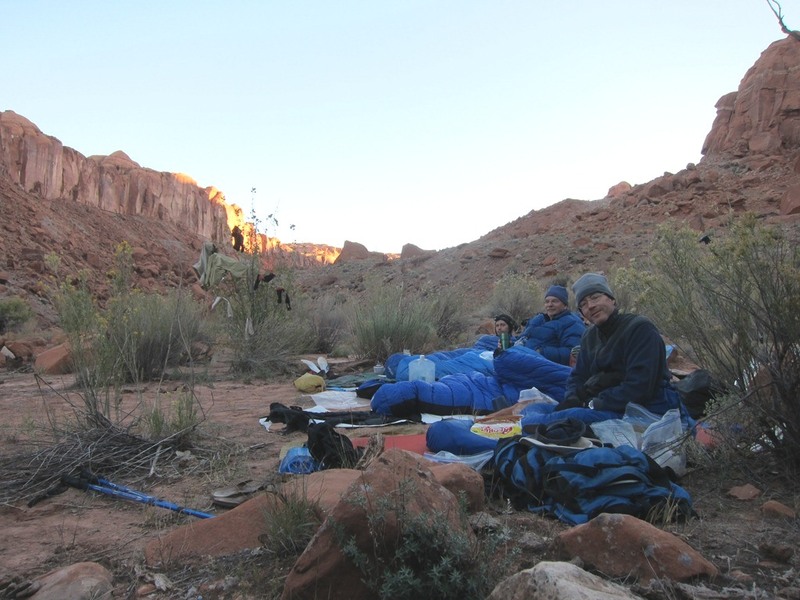 We passed one camp with two tents and then after the first of the four waterfalls in this lower section, came to the big alcove with a pit toilet opposite it high on a bench. 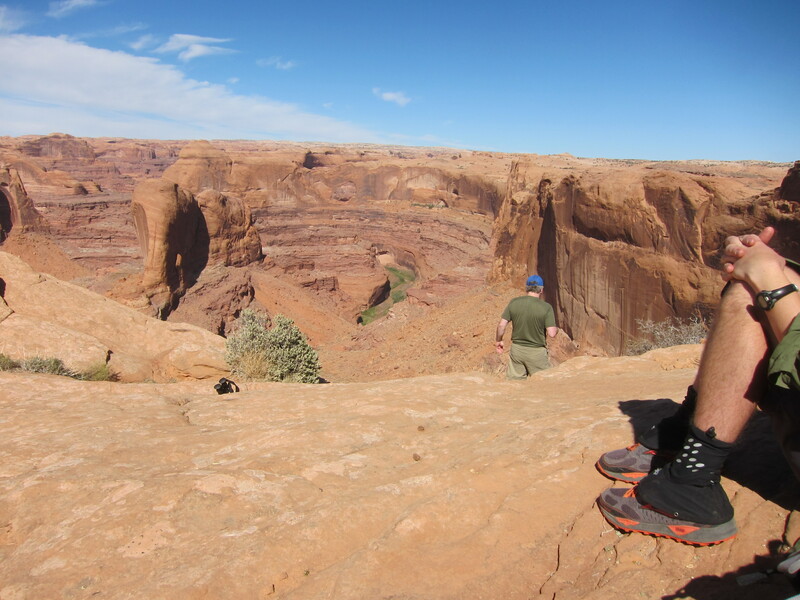 A solo hiker was there and invited us to share it with him but we decided to go a bit further up canyon. At the third waterfall we came upon two hikers getting water from a spring on the north side of the creek. They had come all the way down from Hurricane wash and said this was the first spring they had seen. We decided to fill up for the night and morning too. 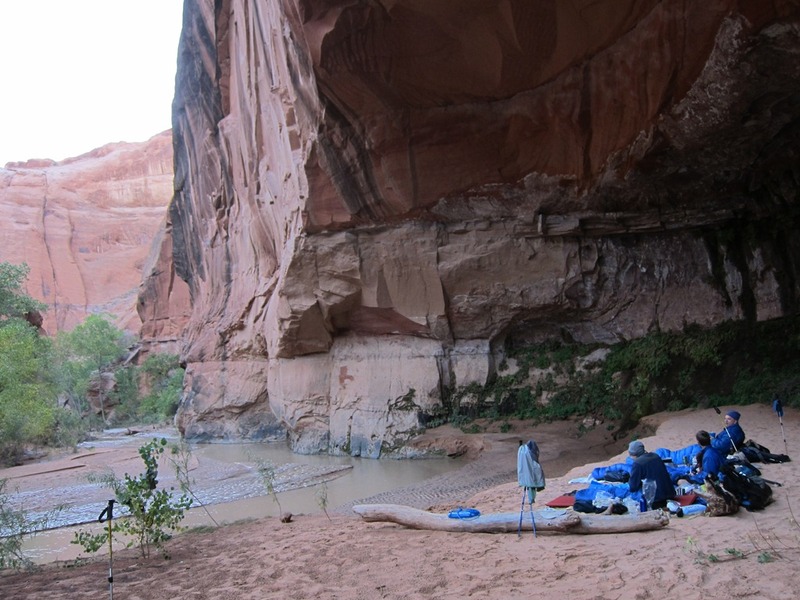 A few turns further up canyon and we find a nice little alcove just above the creek for the first nights camp. About 7 miles today. 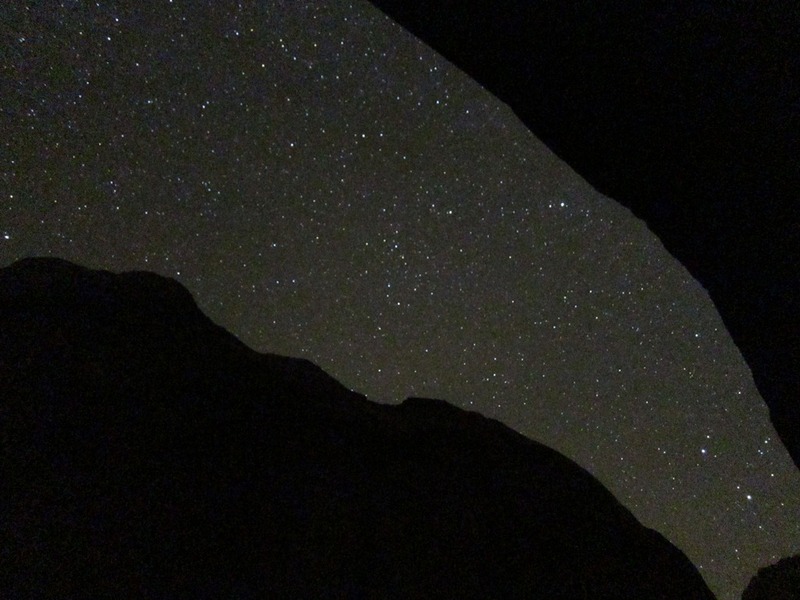 Warm and starry night with a low of only 50 degrees under the alcove. We start the morning with the call of the canyon wren, it would be the only one we heard all trip but it officially signaled a true desert trip. 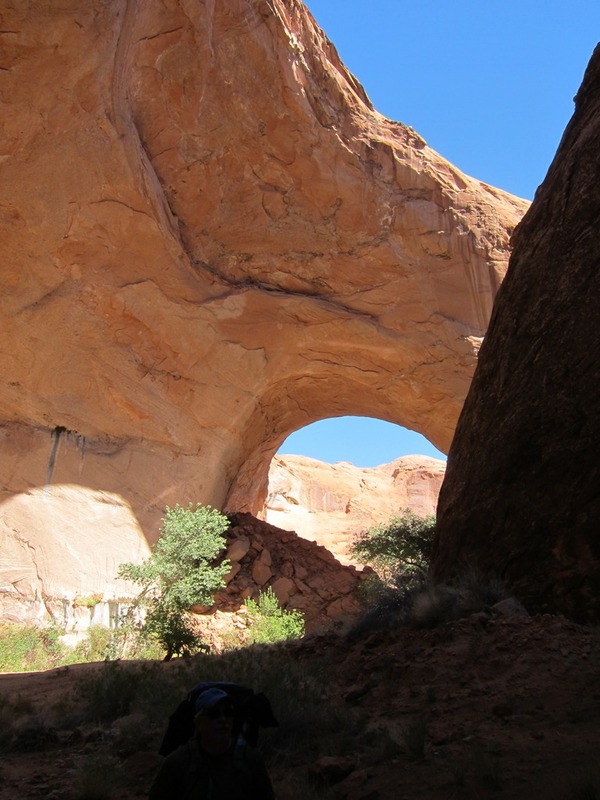 Just around the corner from camp is Cliff or Jug Handle Arch. 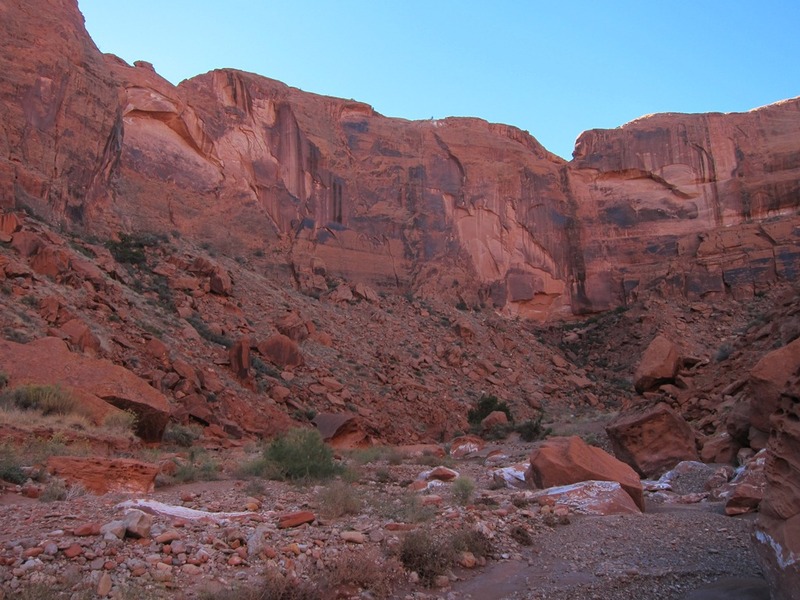 The last of the waterfalls where large Kayenta boulders are in the creek. Beautiful huge walls with equally huge alcoves. 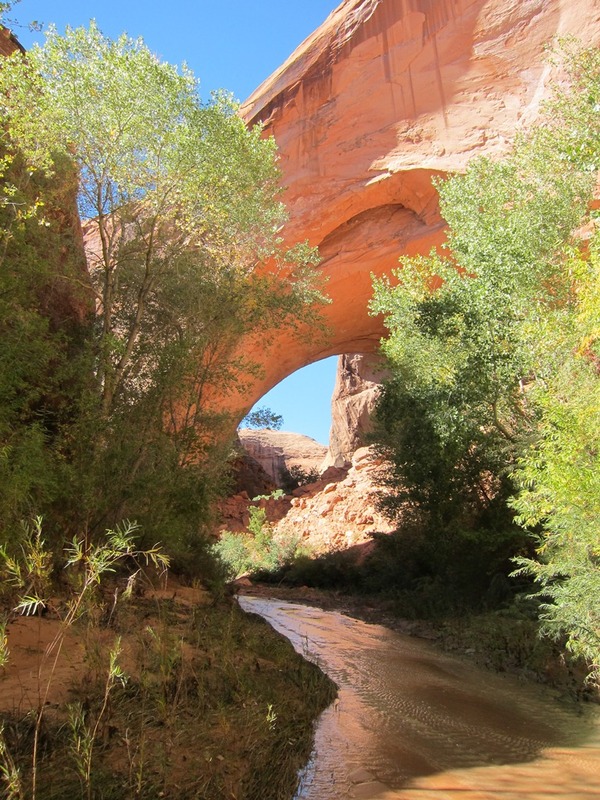 and then we are at Coyote Natural Bridge which is always difficult to get a good picture of. This is the heart of Coyote’s sights, almost too many things to look at. A narrow cut through what was surely an arch that has now collapsed. 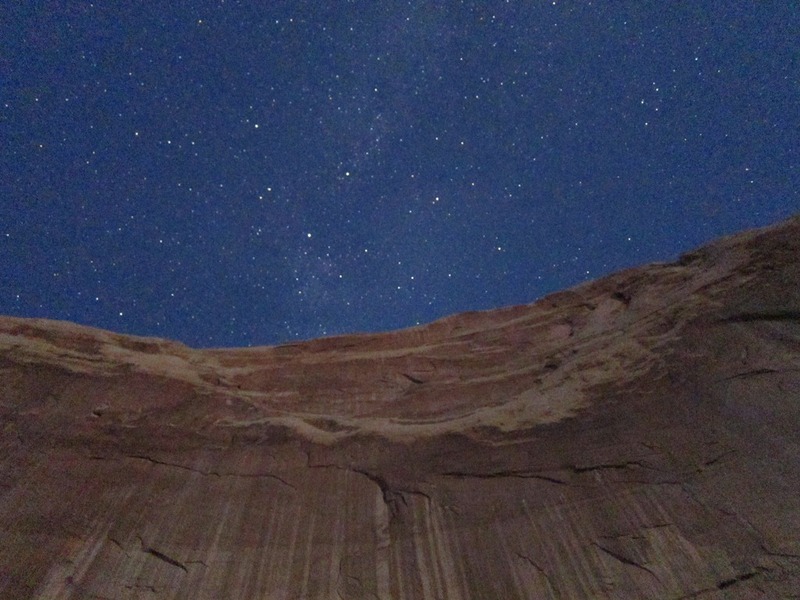 Soon we come to another huge alcove that I first camped under in a rainstorm on Thanksgiving night of 1975, high and dry above the creek as waterfalls poured off the top. 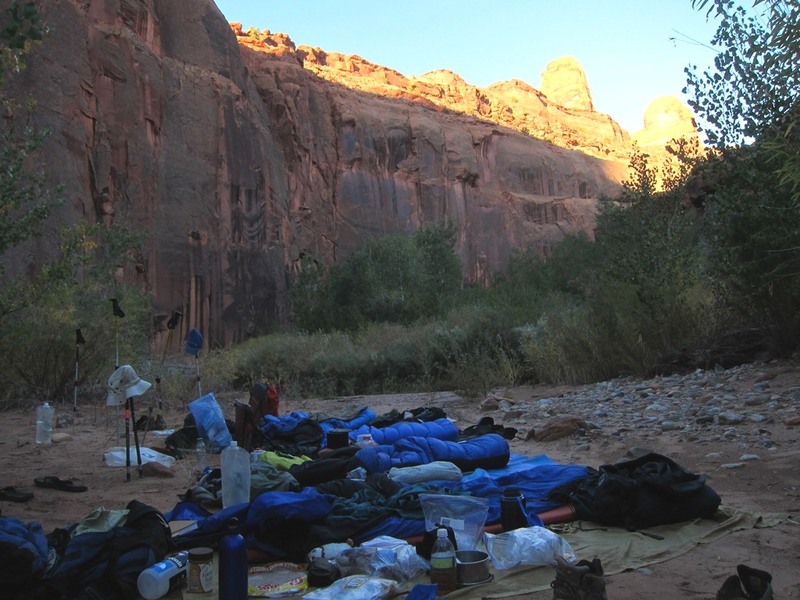 One of my most cherished backpacking memories and still an amazing place to camp. 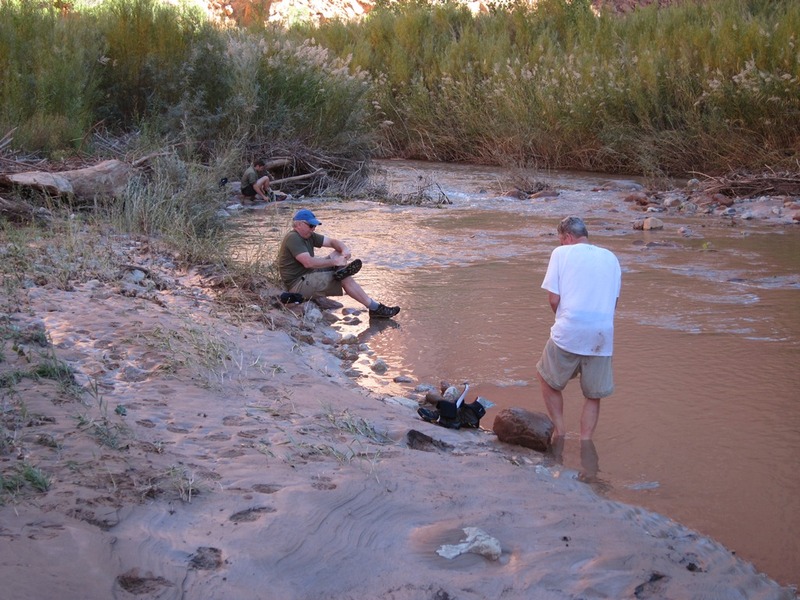 We stop for lunch just downstream of Jacob Hamblin or Lobo arch. The second of the pit toilets is now located just downstream of the arch at the base of the steep climbing entrance/exit route that leads back to the trailhead parking area on 40 mile ridge. 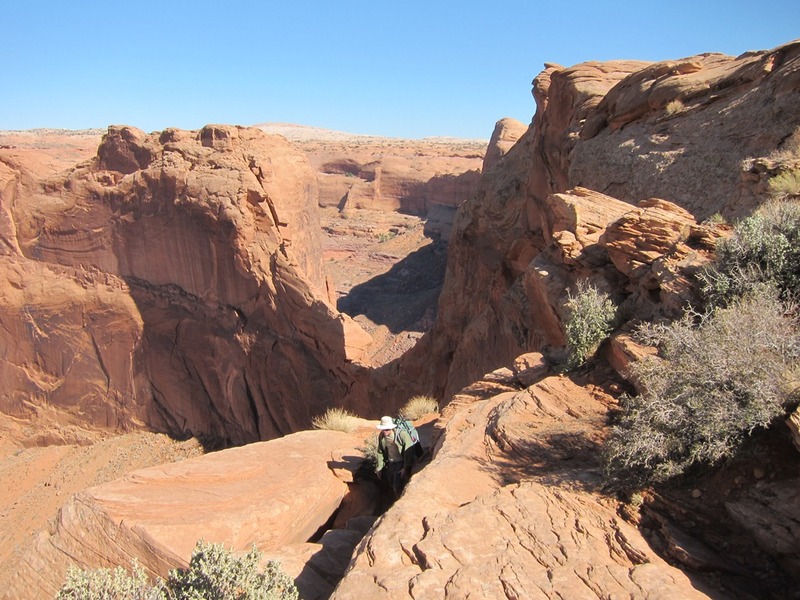 Around the fin that holds the arch is one of the tightest turns I have ever seen on the Colorado Plateau with its own amazing overhang. 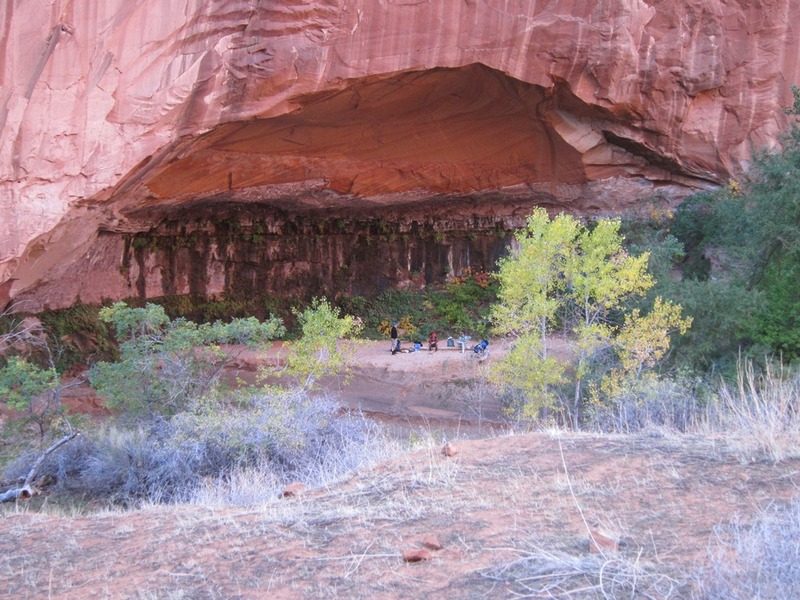 We have passed several more groups and then run into day hikers on the upstream side of the arch too. Quickly we are at the confluence with Hurricane wash where most folks come in from the Hole-in-the-rock road and the Hayduke trail also goes up. 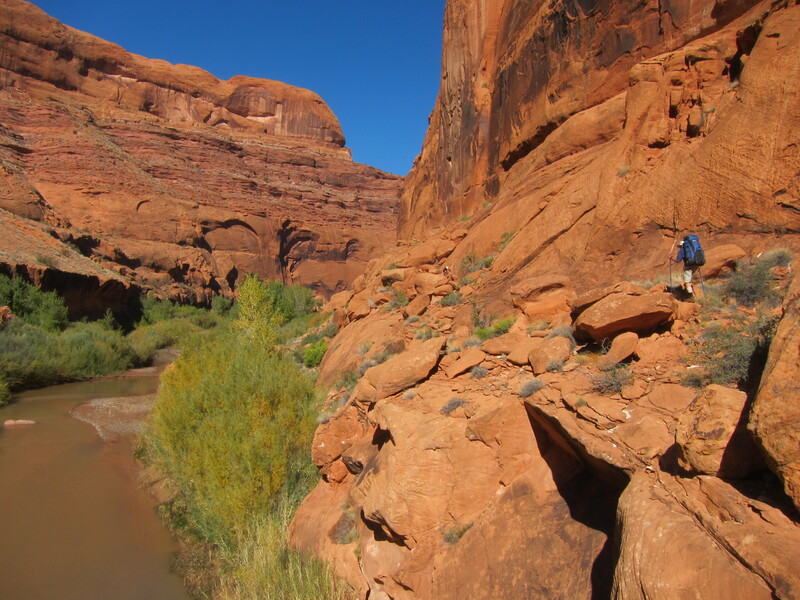 We head on up Coyote Gulch looking for a good spring to fill up our water bottles for tonight and tomorrow, enough to get us over the mesa and down to the Escalante river. 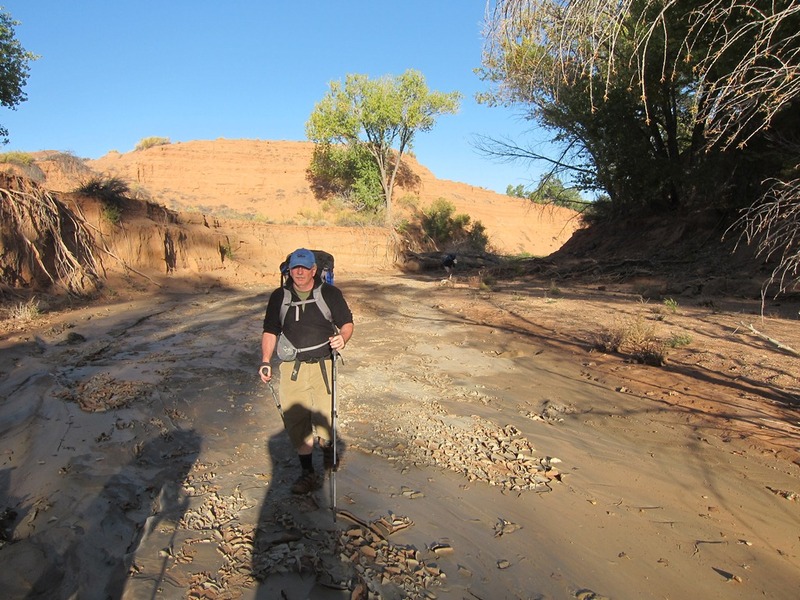 We continue on towards the confluence with Dry Fork Coyote, with more stream crossings and quicksand that captures John up to his thighs at one place. 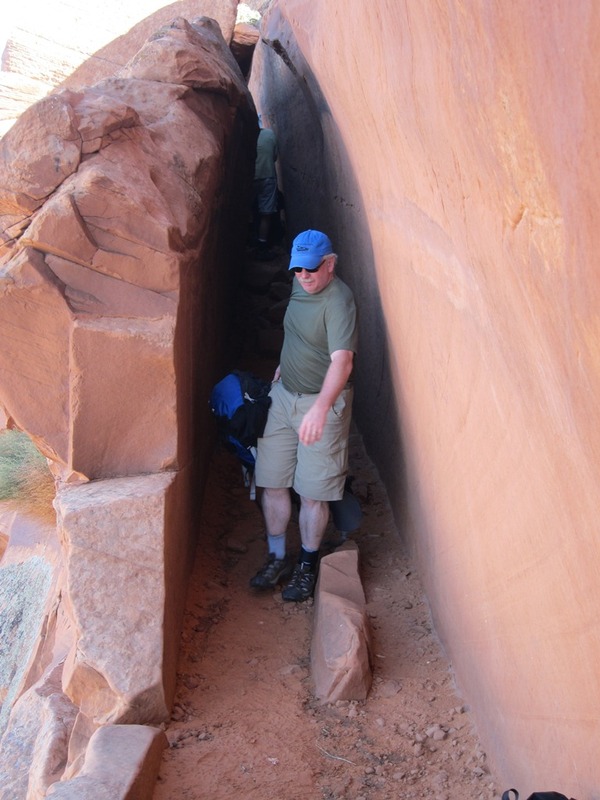 Surprised by a narrow section with a pouroff that we have to climb around on the south side. 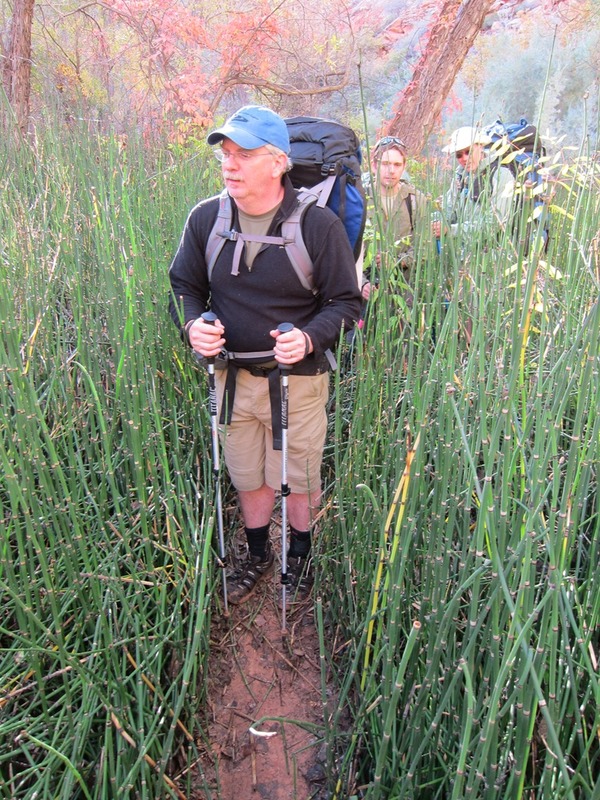 We finally start up Dry Fork and it is not dry for at least the first mile and is filled with much vegetation. 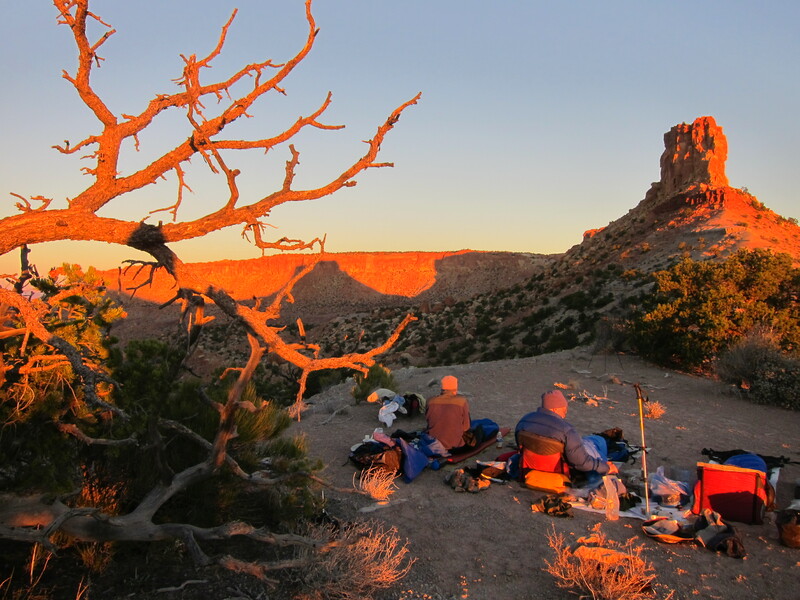 We climb out on the north side up onto a slickrock bench for the night, very windy until the sun sets but the sky is amazing. ~11 miles today. 44 degrees the low and we are moving a bit earlier to allow for plenty of time to make the crossing over the top of the mesa to Scorpion Gulch. 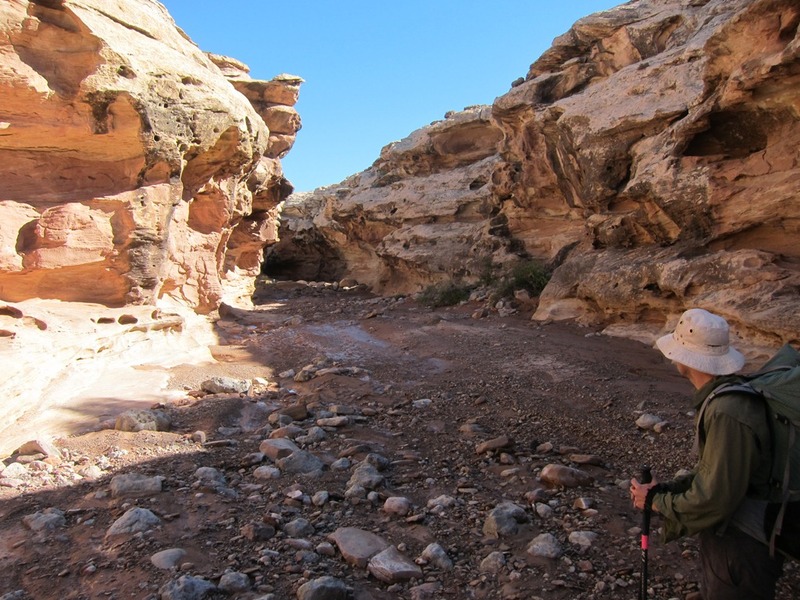 We finally walk out of the flowing water and mud and get to the side canyon we want to go up. There are two older gentlemen camped there, they are as surprised to see us as we are them. 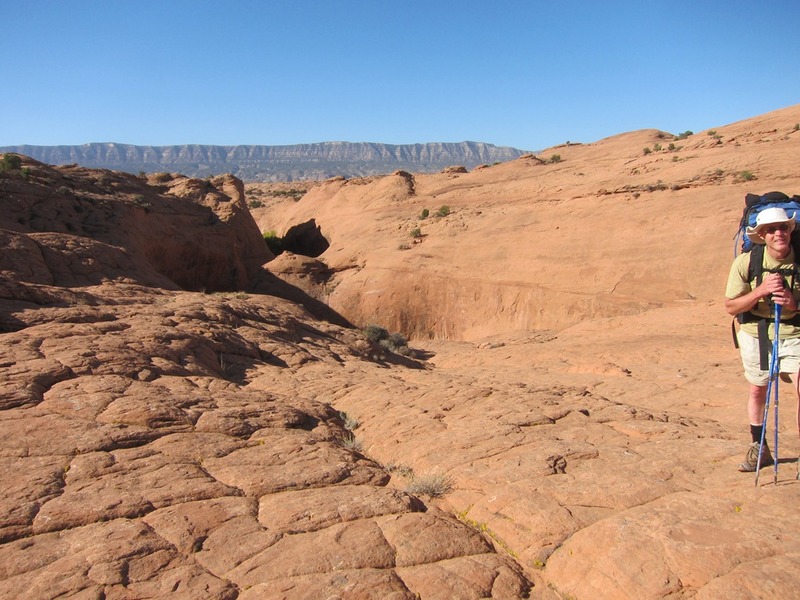 The one fellow has lots of experience in the area and says there are pouroffs up the canyon and we will most likely need to climb out of the canyon on the east side and go over the slickrock. 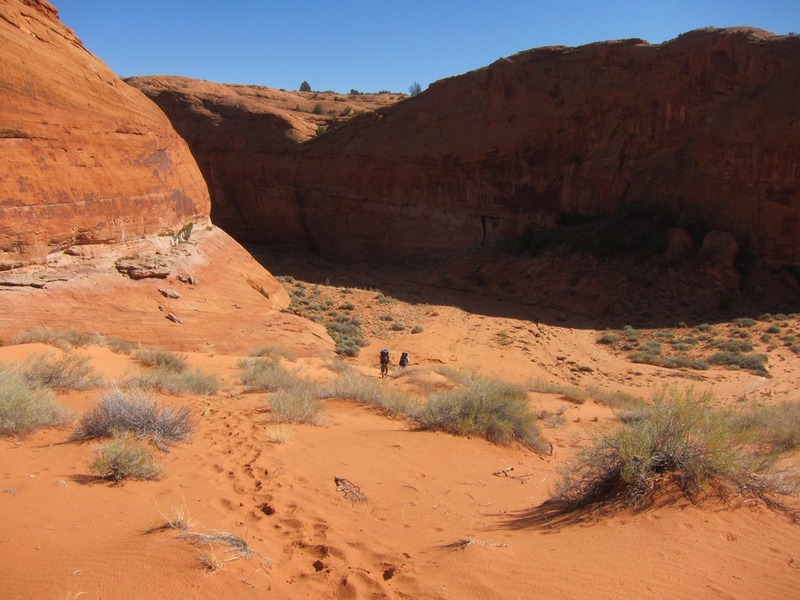 We thank them and head on up the beautiful pink sand bottomed canyon. Sure enough about two miles up there is a pouroff with a large pool at its base. 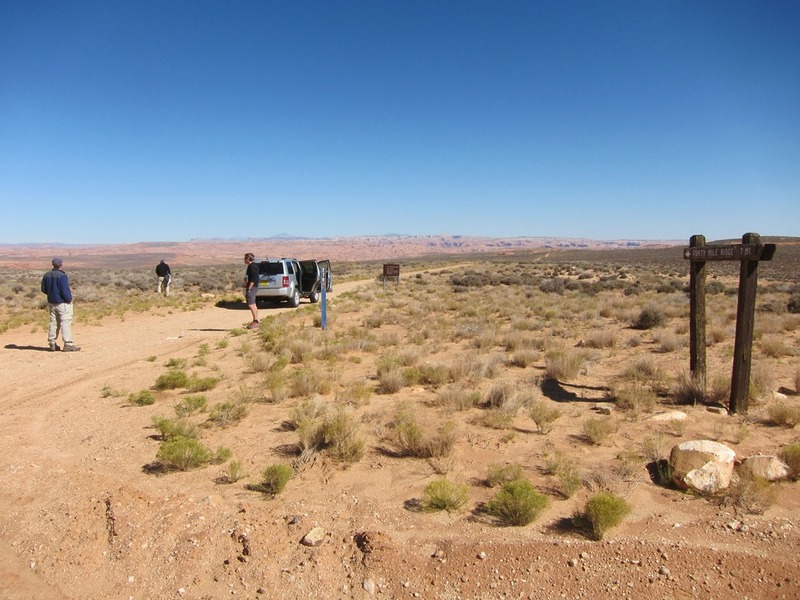 We turn around and go about a mile back to a ramp that we can use to climb up onto the slickrock. 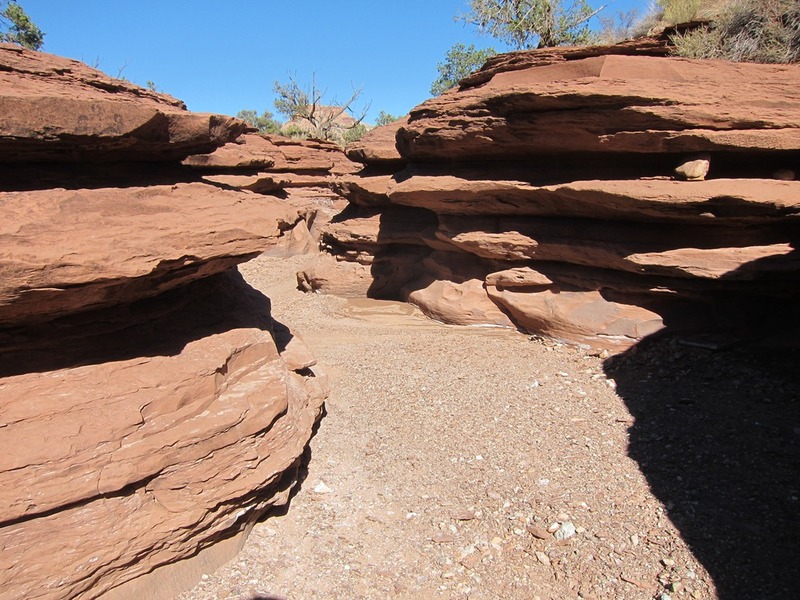 This is some of the best slickrock walking around and it is quite fun finding our route up and across it. Huge views west to the Straight Cliffs. 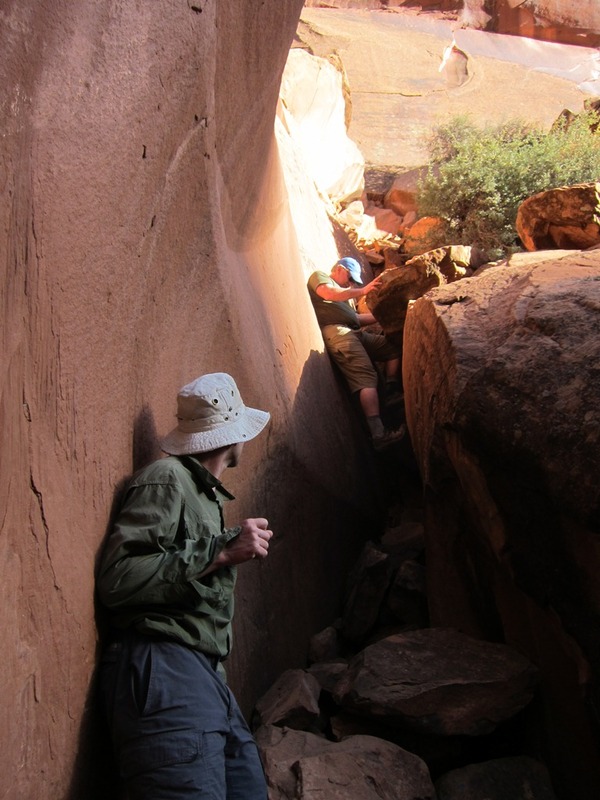 We come to a side canyon across our route but we head up canyon and find a way down and across it. Finally, near lunch time, we make it to the top and the views both west and east are astounding including the pass in the Circle Cliffs we will be at in two nights and behind that the 11,000’ Henry Mtns. that Lee and I will go over in 7 days. 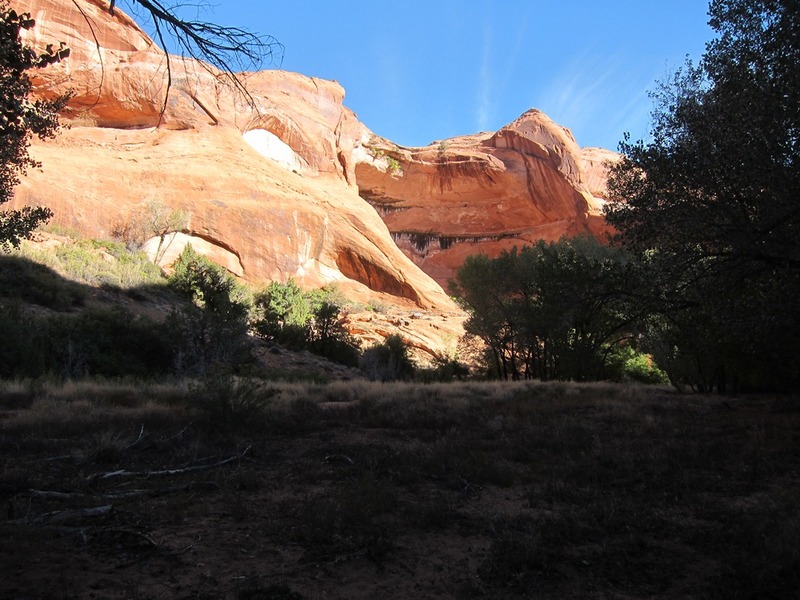 Hot again today, high 70’s and we find a place in the shade for lunch then begin the walk over to the top of Scorpion Gulch. 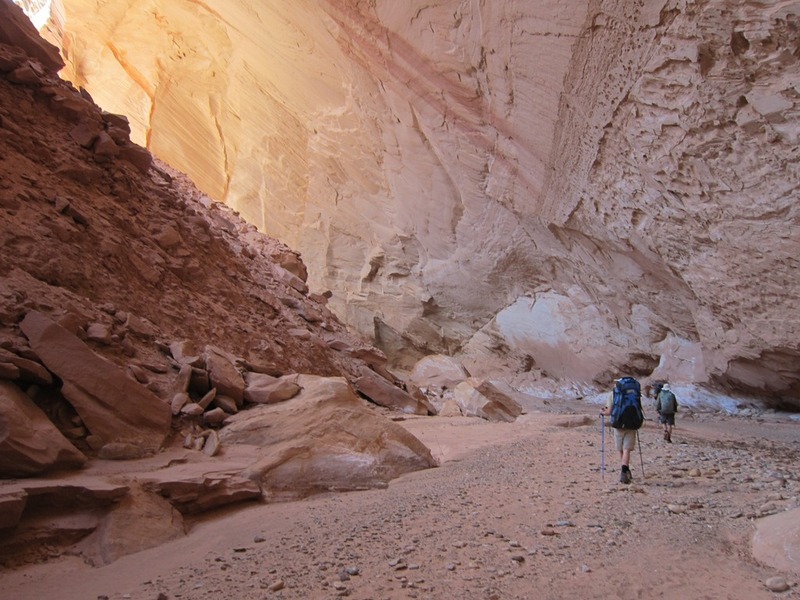 We pick up the Scorpion horse trail around the north side of the canyon and find the big dune that is the access to the bottom of the canyon. 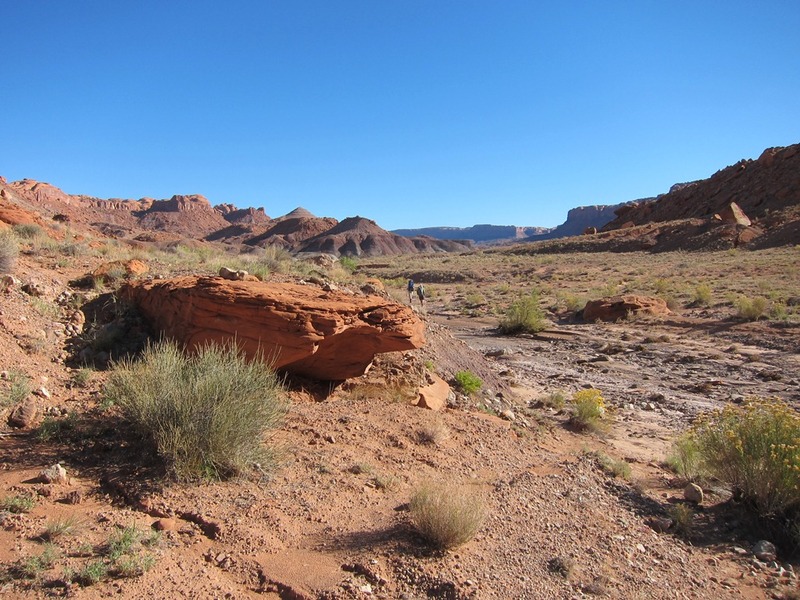 The upper part of Scorpion is dry and sandy then cottonwoods begin to appear and you have to beat your way through willows and other vegetation for a distance until you can find a trail high on the south side. 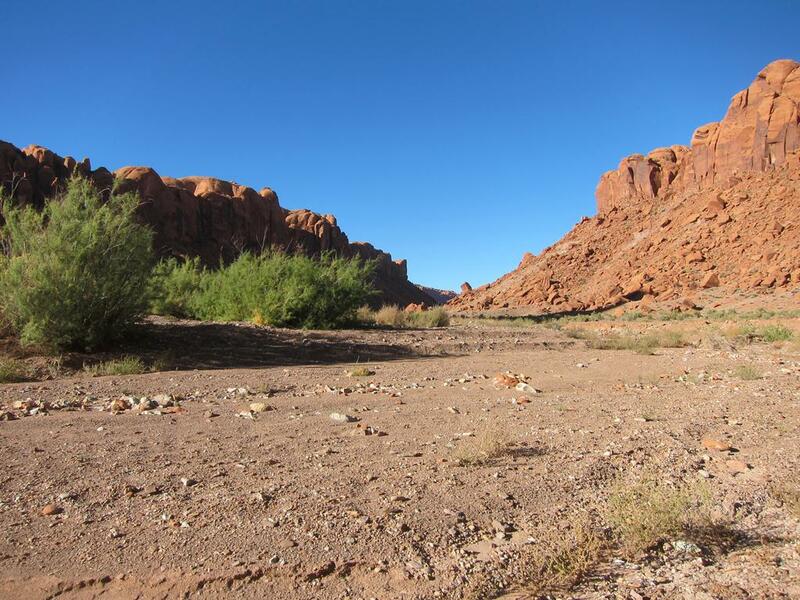 Finally you get down to the rocky bottomed wash and some water begins to flow intermittently. 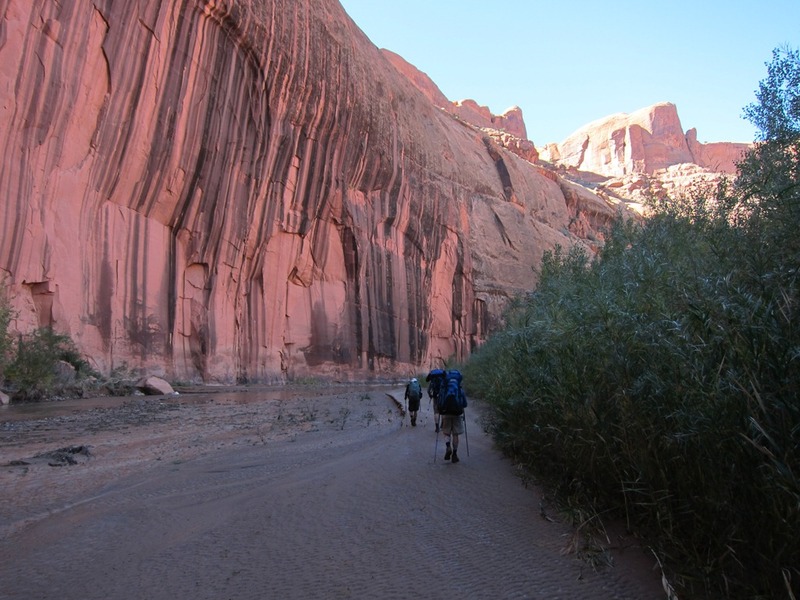 About a mile from the Escalante is a huge rock fall that we have to climb up and through and then down to get around which includes handing down packs in places. A little more bushwhacking and poison ivy avoidance near the confluence and we are down at the river. Nice campsite on a sandbar just below where the now tiny creek flows into the river. ~11 miles today. or just wading up the knee deep river with an occasional quick-sandy bottom. Exhausting and maddening, good thing we only had this short section to do. Lunch was very quiet. After lunch it was quite a bit easier with less willow beating because of longer gravelly wash throughs, routes right along the base of the sandstone and a much more stable river bottom. and spent some quality time washing all the sand and gravel out of our socks and shoes and retiring the neoprene socks for the rest of the now dry land trip. 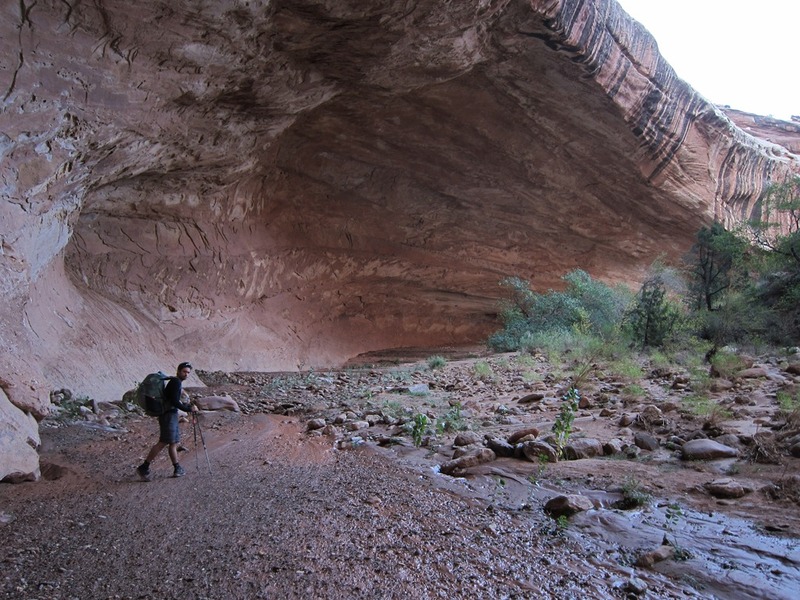 Lower Moody canyon has huge Navajo sandstone walls and a small clear stream that trickles for several miles. 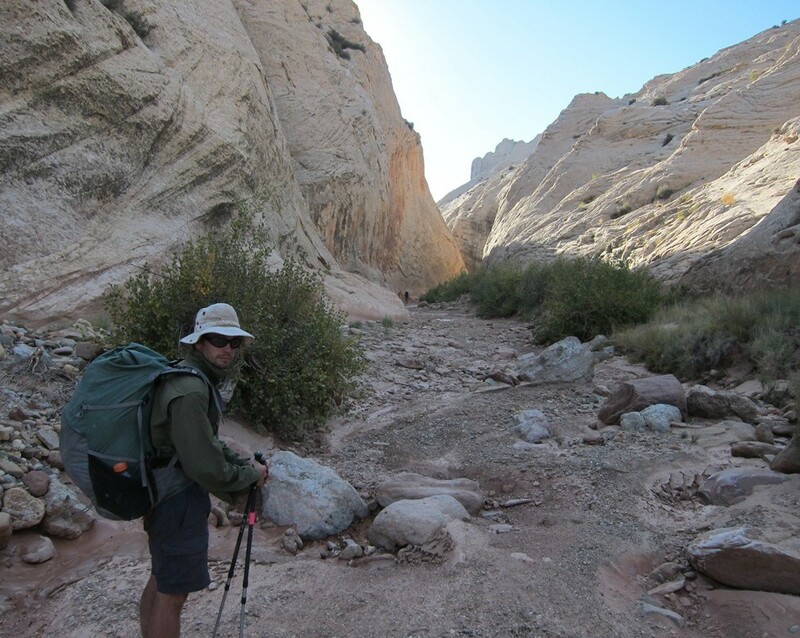 We reach Middle Moody canyon and we go east up it, looking for a spring on the south side. 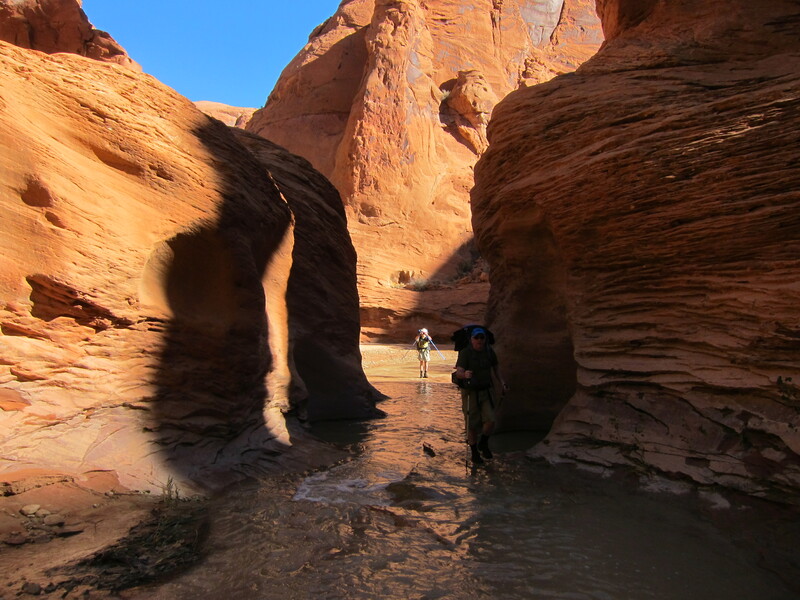 Lots of very muddy water in the wash but nothing we wanted to draw from. 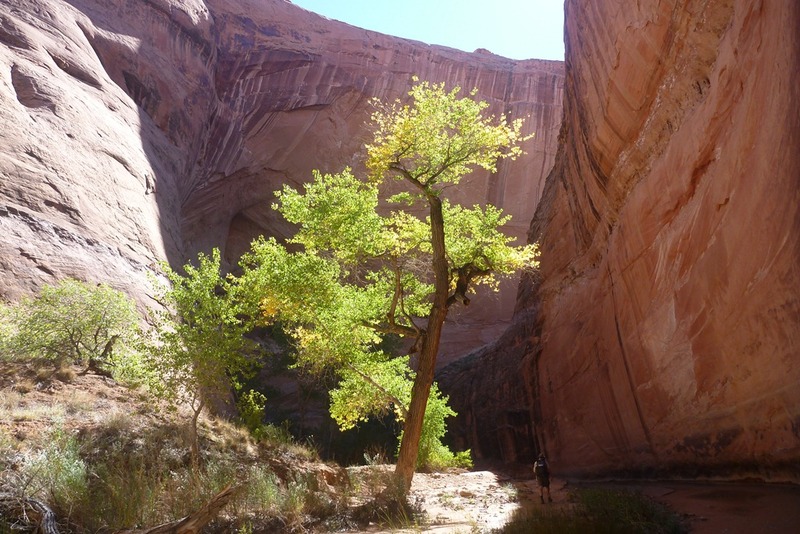 There is a cottonwood up on a bench and John follows the tiny wash way up and finds the small spring with clear water. 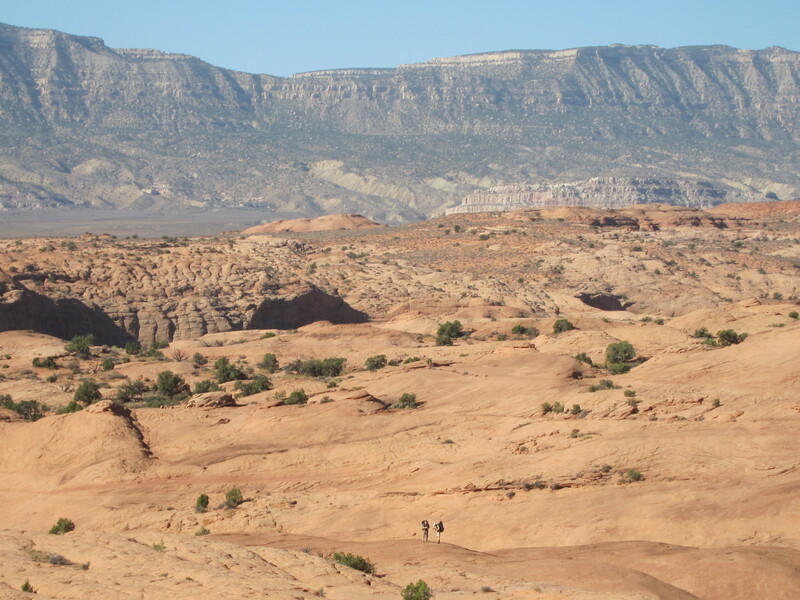 The canyon begins to get wider here as the Chinle Formation begins. 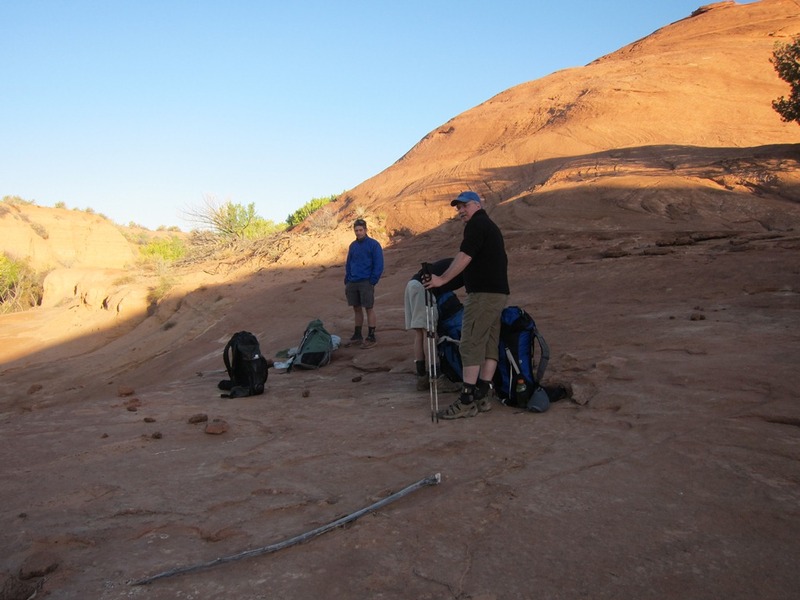 We camp up on a small bench above the wash and collect 6-7 quarts of water each, enough to carry us for the next day and a half. ~10 miles today. then many sections of mud and siltstones with lots of ancient ripples and water markings. We look for dinosaur tracks but see none but plenty of petrified wood. 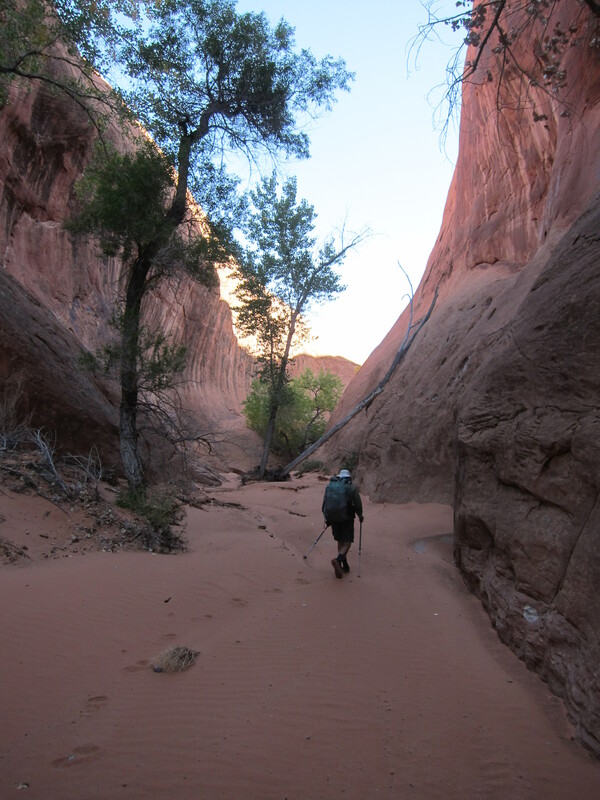 We reach the side arm of the canyon we need to follow up towards the pass in the Circle Cliffs and soon come to a small pouroff. 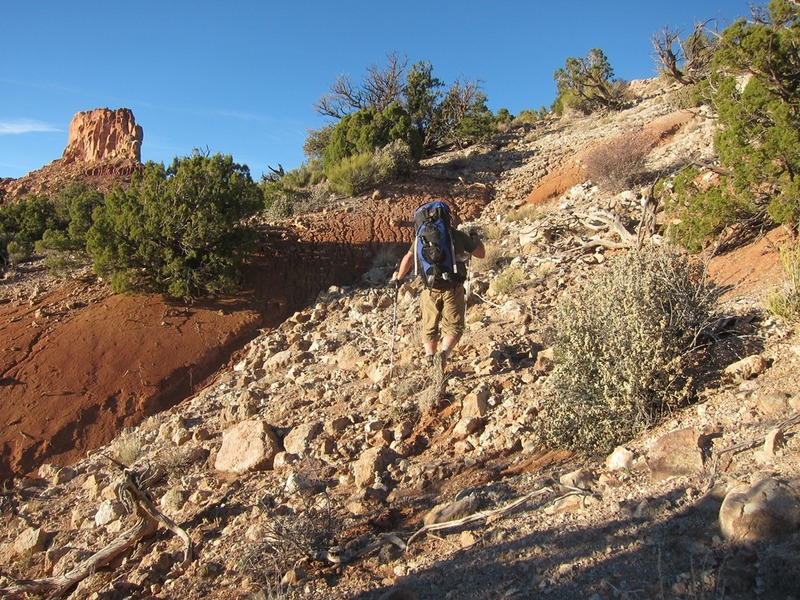 We climb up on the south side and decide to start to make the climb up towards the canyon rim and the pass. 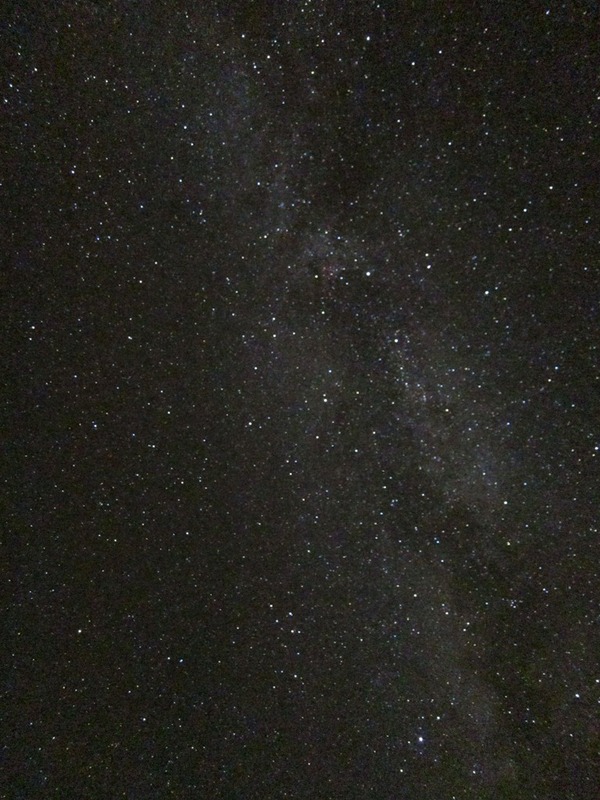 There is reportedly an old mining track somewhere up there. Steep climbing sections up through each successive layer, no track appears. We realize we started up too far down canyon and now have to work our way across bouldery slopes towards the pass. Tough work at the end of the day. Up and down but finally that last push to the crest. Exhausted but the reward is totally worth it. Clear views east and west for a hundred miles or more. 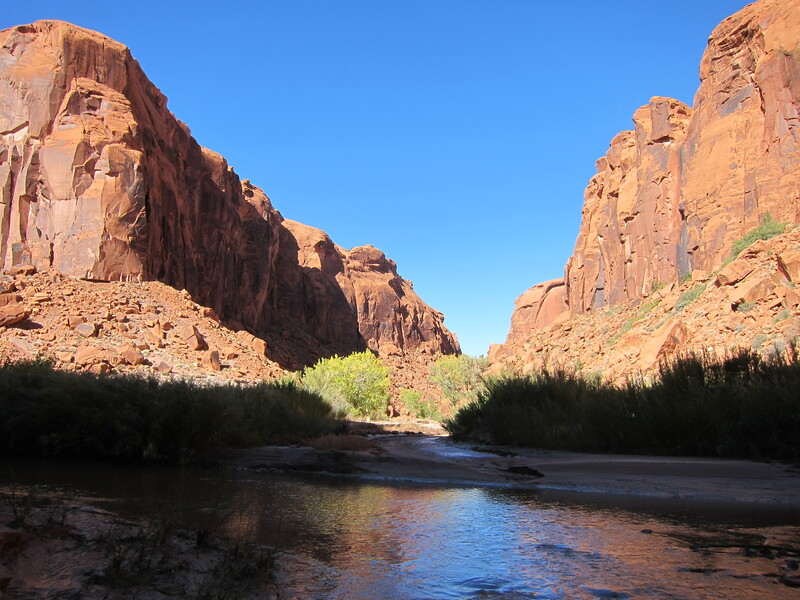 East- all of the Waterpocket fold, Halls creek, the three big mesas (Big Thompson, Swap and Tarantula) with the Henry Mtns. on top. The Abajo Mtns. can be seen on the far horizon. 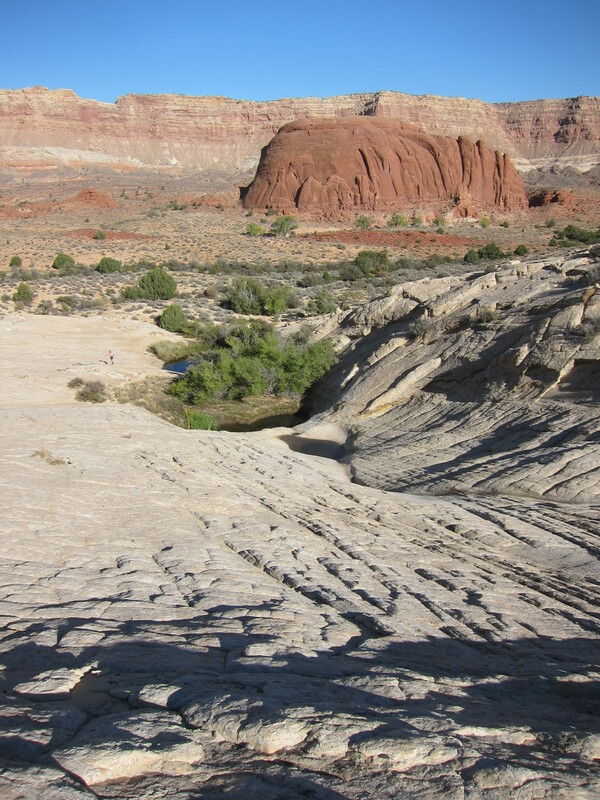 West- all of Middle Moody canyon, the Circle Cliffs, The Straight Cliffs and the Kapairowits Plateau. This is maybe the finest campsite I have ever had. 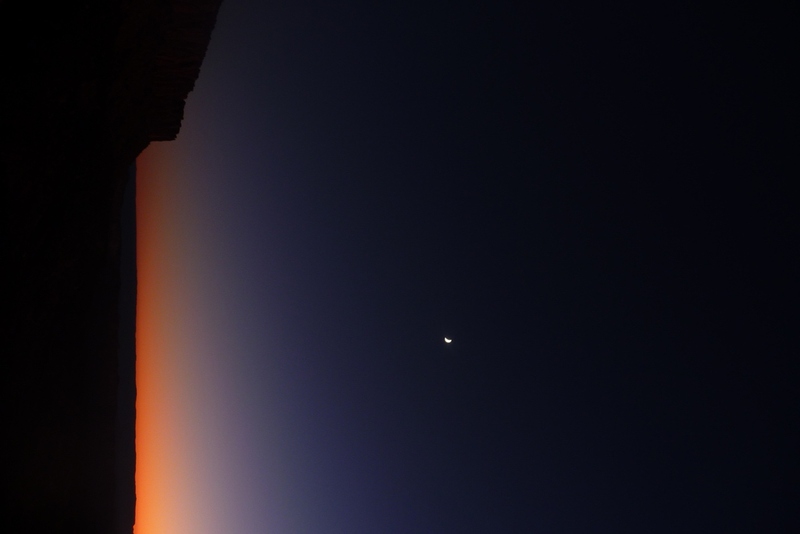 Warm evening, no breeze, beautiful sunset and stars with a new crescent moon! About 10 miles today and this would be the highest elevation for this first section at 6500’. A glorious sunrise and start to the day, 47 degrees with just a slight breeze. 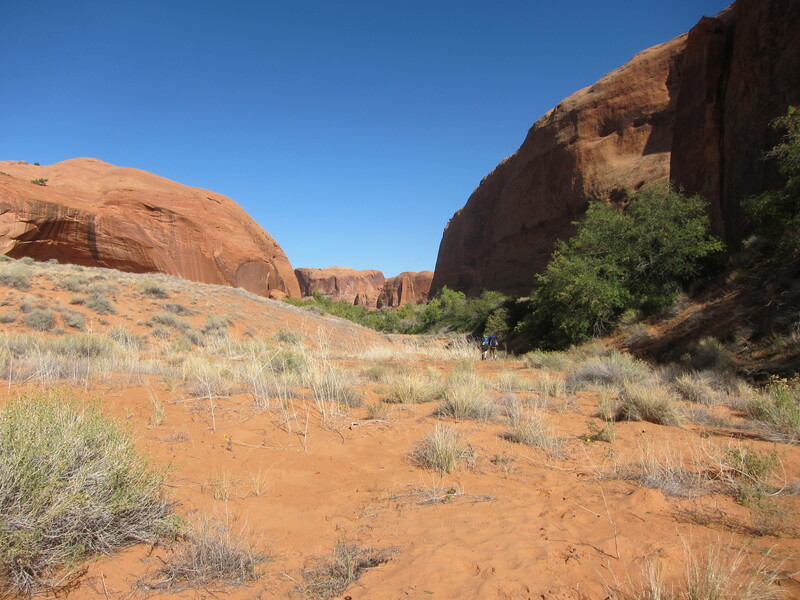 but eventually we had to start the long descent down the Red Slide to the bottom of the Waterpocket fold to Halls Creek, losing the 2000’ of elevation we worked so hard to gain yesterday. 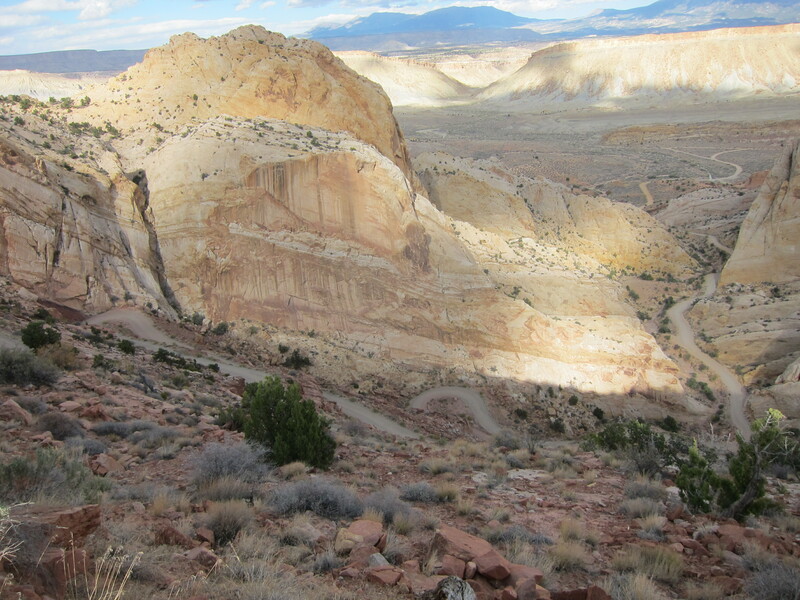 It took a little winding around the base of the Circle Cliffs amongst the junipers but we eventually found the old mining road that would takes us down to Halls Creek. 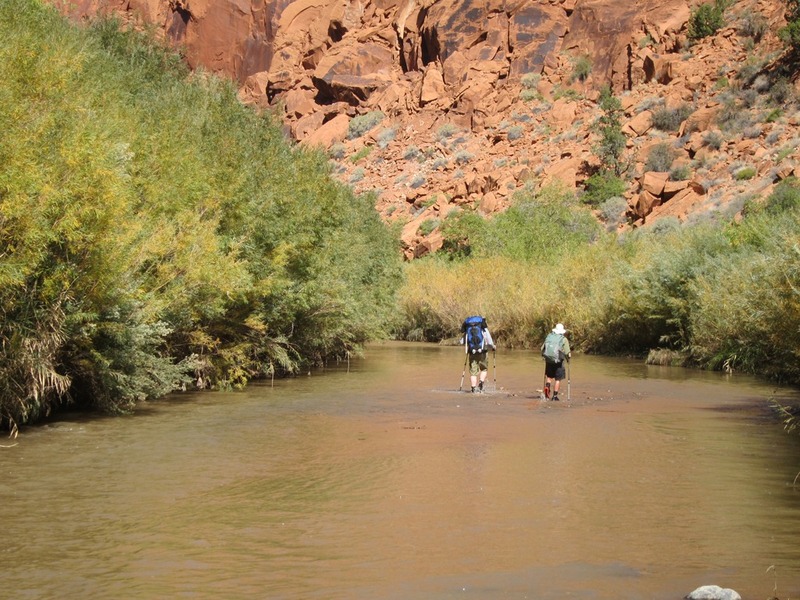 Surprisingly there was water running in the wash and it did so for about another half mile upstream where we stopped for lunch in the shade. 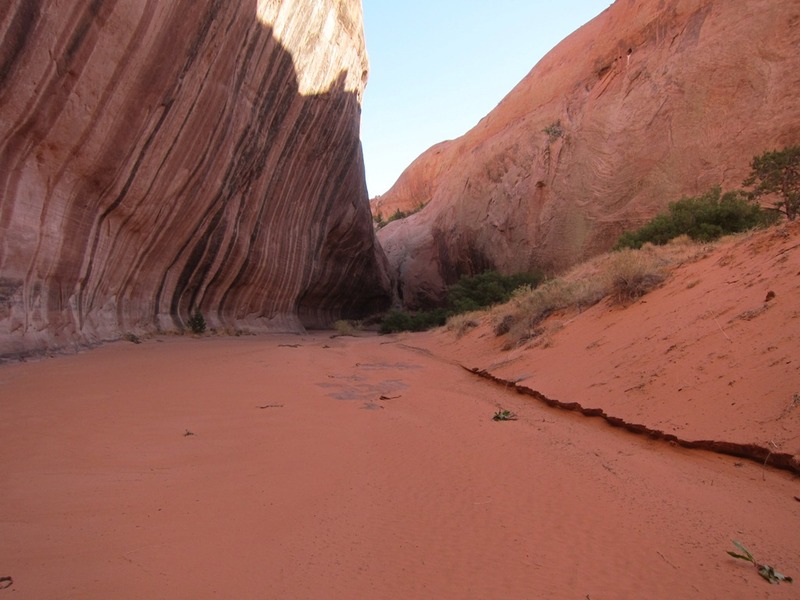 A warm walk up Halls creek, cutting the meanders where we can via cattle trails. 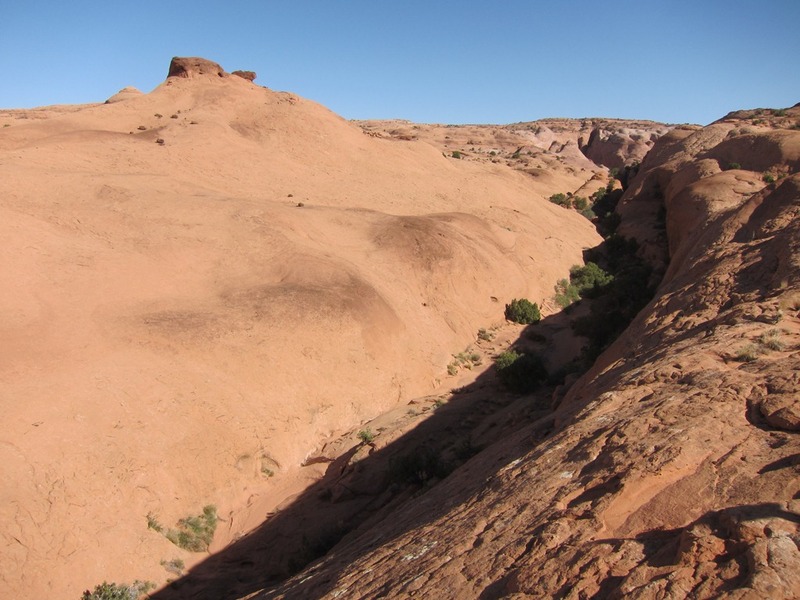 We are in Capital Reef NP now which covers the majority of the Waterpocket Fold. 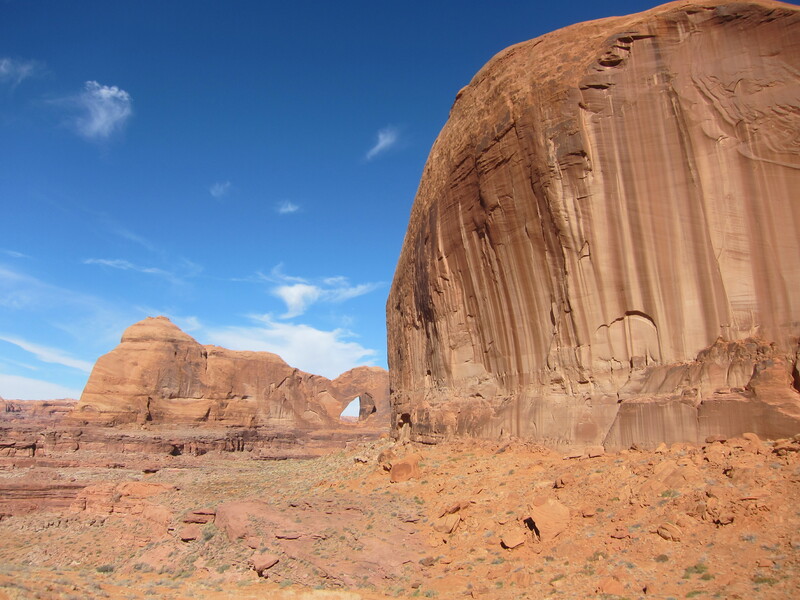 They called it Capital Reef because they thought the white sandstone jutting up looked like capital domes. 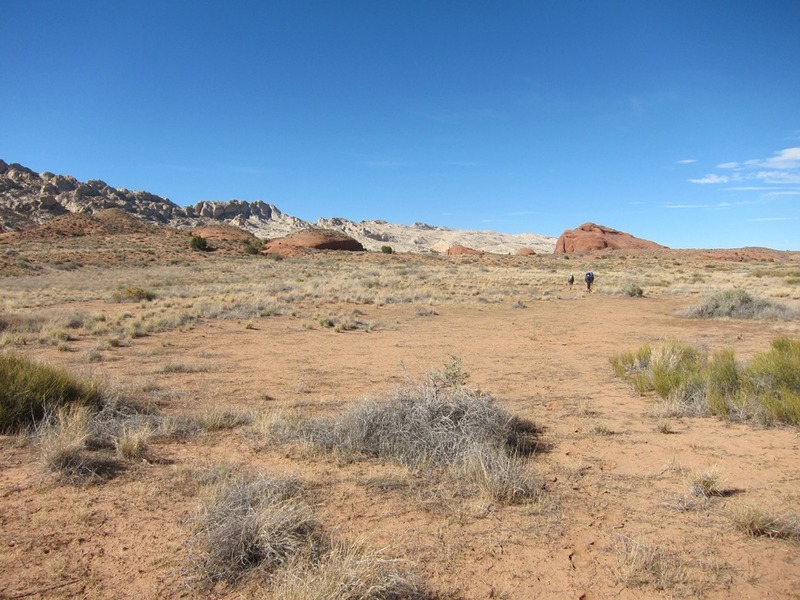 We are headed to Muley Tanks which is the only generally reliable water for nearly 40 miles from the spring in Middle Moody canyon to the springs in Swap canyon. 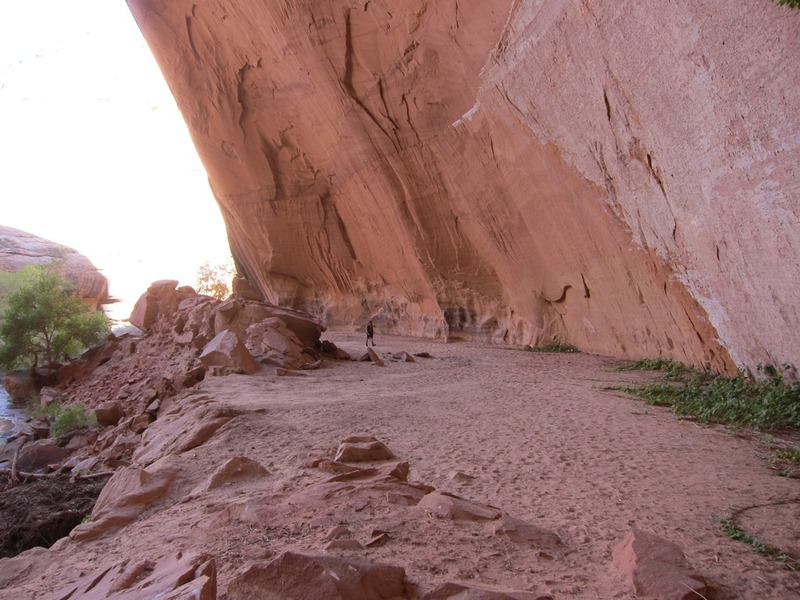 Seven water holes in the white sandstone that pour one into the other that people have used for years. We arrive mid-afternoon and find lots of clear water flowing. We gather water for the next day, enough to get to the car, and then decide to rinse off some trail grime. 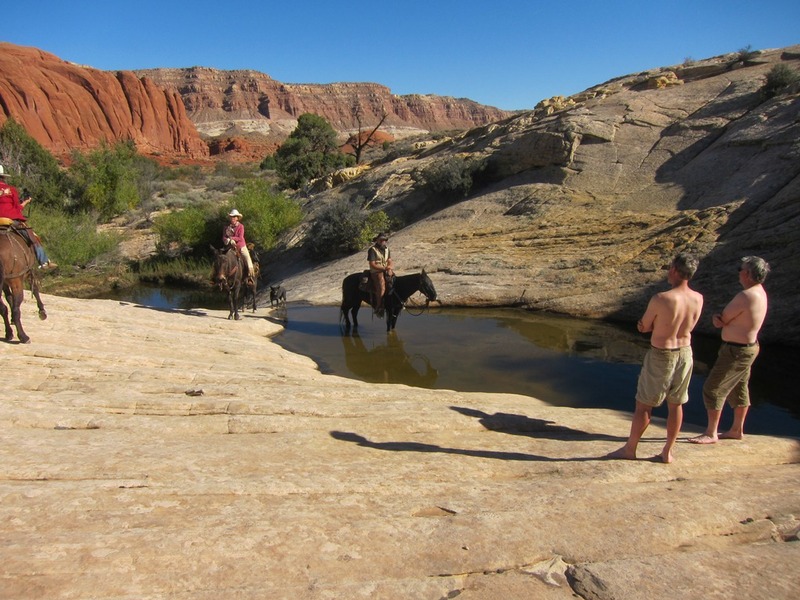 Just as we are dripping wet and without much (or any) clothing on three folks on horseback ride up! It was quite funny and we had a great laugh and then visit with these locals. 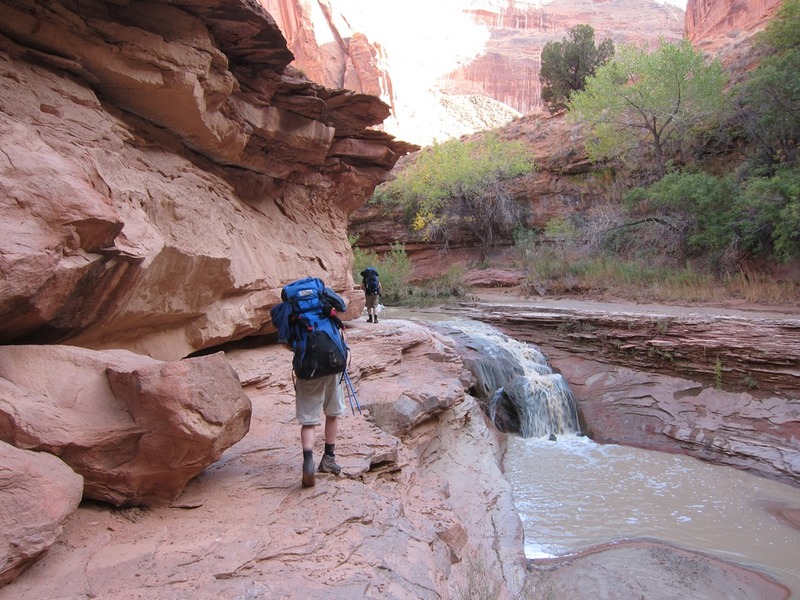 Refreshed, we move on to the mouth of Lower Muley Twist canyon which is right around the corner. 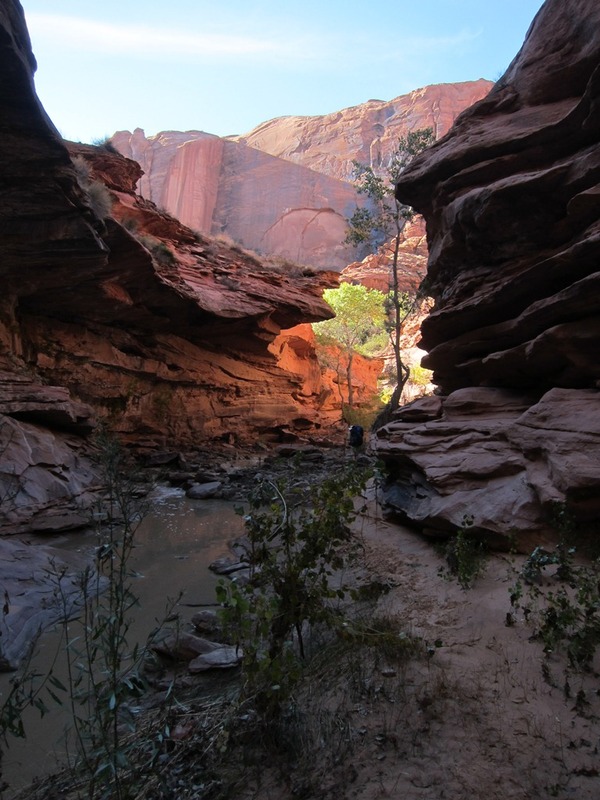 This canyon cuts into and then runs north right through the spine of the Waterpocket Fold. 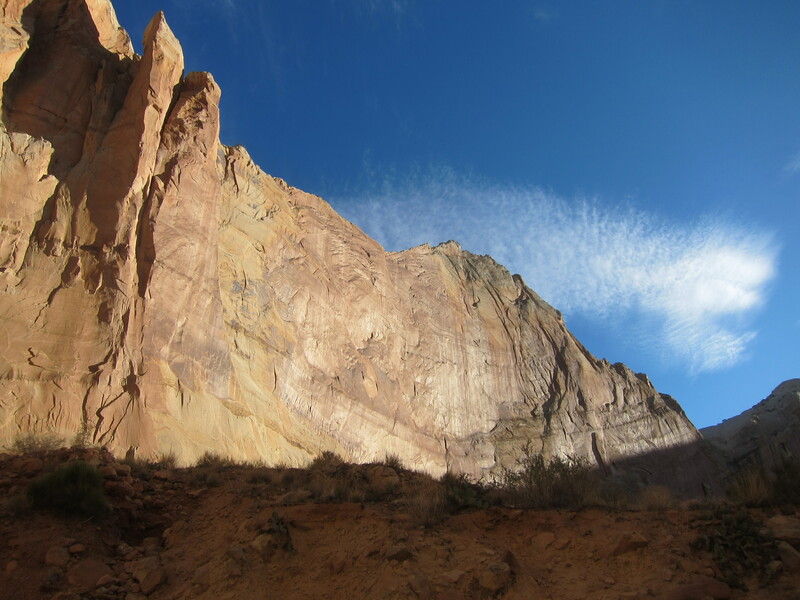 The huge white Navajo sandstone cliffs are staggering and the tallest we have seen on the trip. 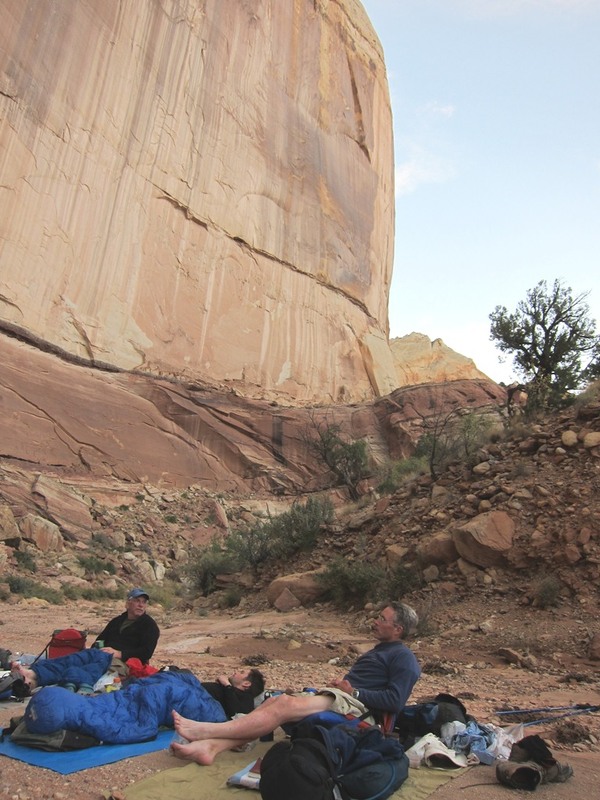 We walk for a mile or so and find a campsite for the night at the base of one of the soaring walls. A great last night with Scott and John, stars, conversation and a bit of bourbon. About 11 miles today. The wind blows really hard through the night but is calmer in the morning, 51 degrees. 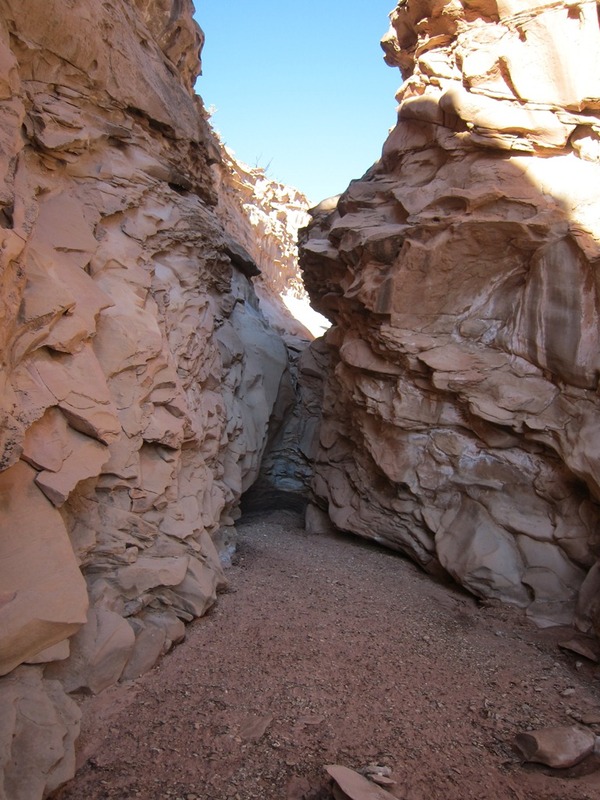 Some of the deepest alcoves around are in this canyon and we walked under many all day. Not too far up canyon we took a wrong fork west and didn’t realize it until we came to a small pouroff, checking the GPS we discovered our mistake, 1.5 miles up the wrong canyon, damn! Back down and then up the correct way, once again reminded of how much harder it is to follow a wash upstream than down. Beautiful walk with lots of different geology including one rockfall we had to squeeze through. 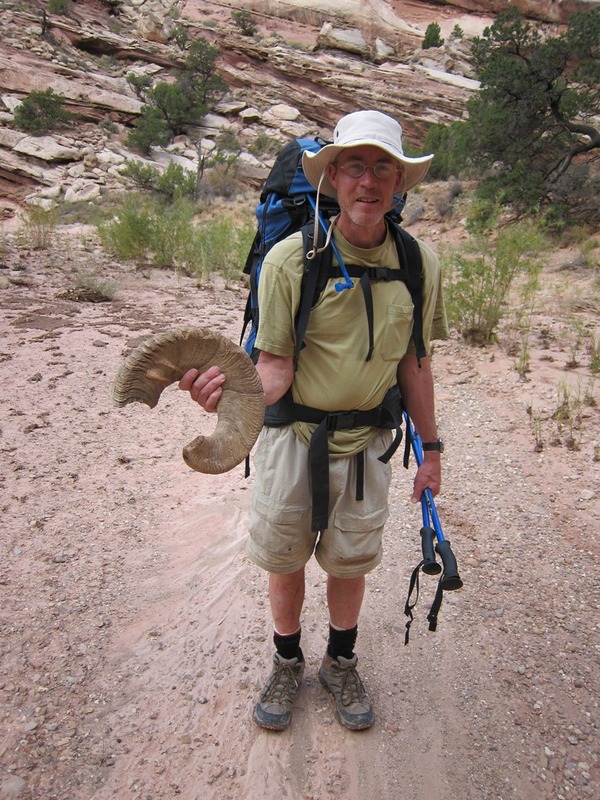 John found a full curl horn from a desert Bighorn sheep too. 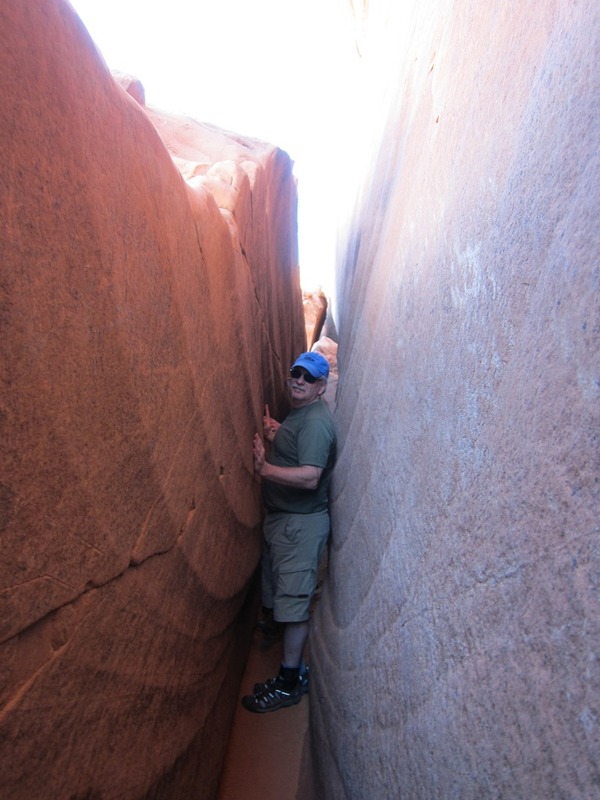 Very near the trailhead the canyon gets very narrow one last time. 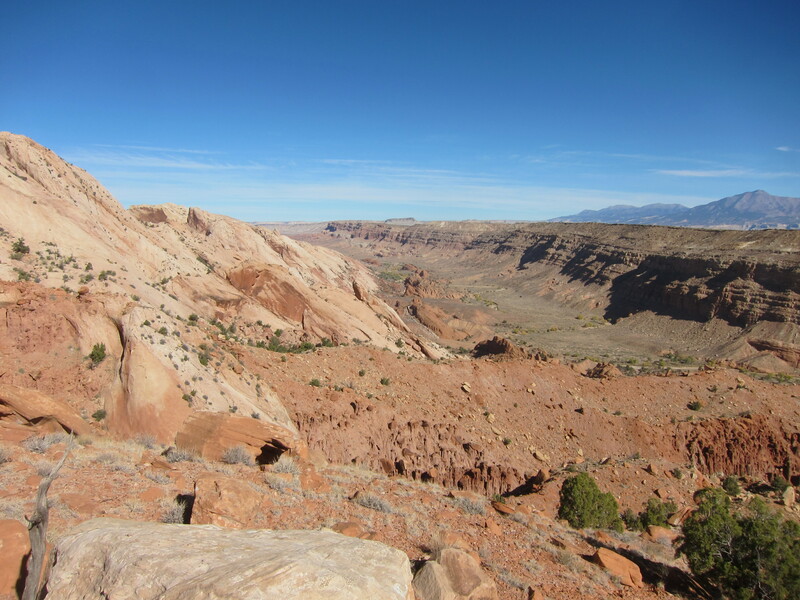 and start down the crazily switch backed Burr trail towards Swap canyon in the distance and into the second part of the trip. 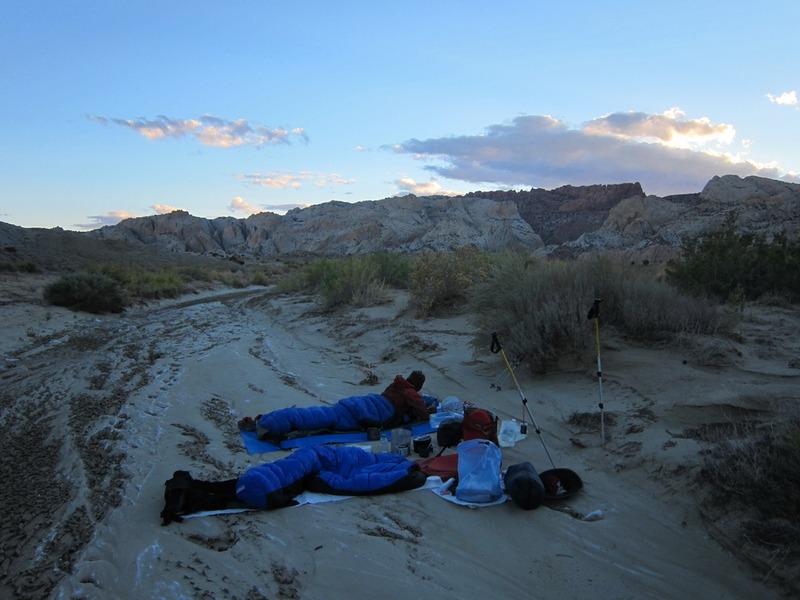 Camp for the night is on the hard packed clay wash at the mouth of Swap canyon with a great view of the Capital Reef. ~16 miles today. 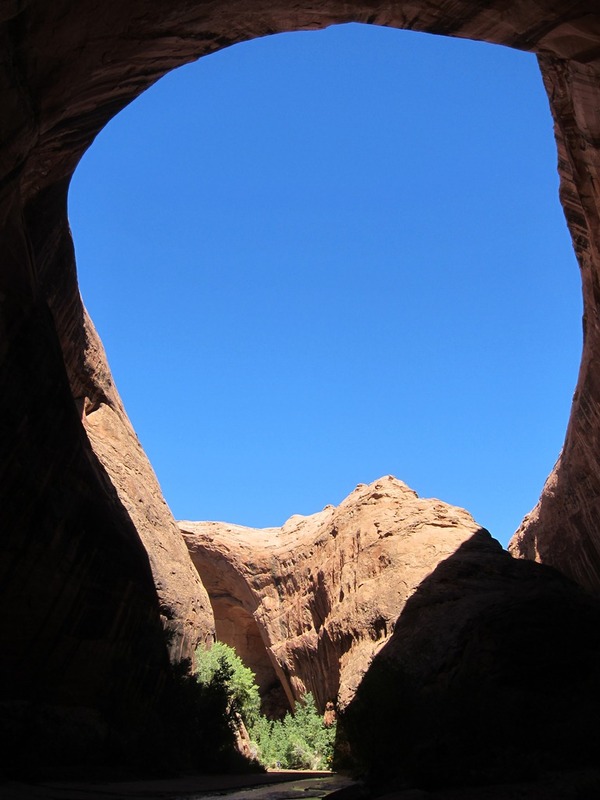 This entry was posted in Southern Utah and tagged burr trail, capital reef np, circle cliffs, coyote gulch, escalante, hayduke trail, hole-in-the-rock road, lower muley twist canyon, muley tanks, scorpion gulch. Bookmark the permalink. This is excellent. 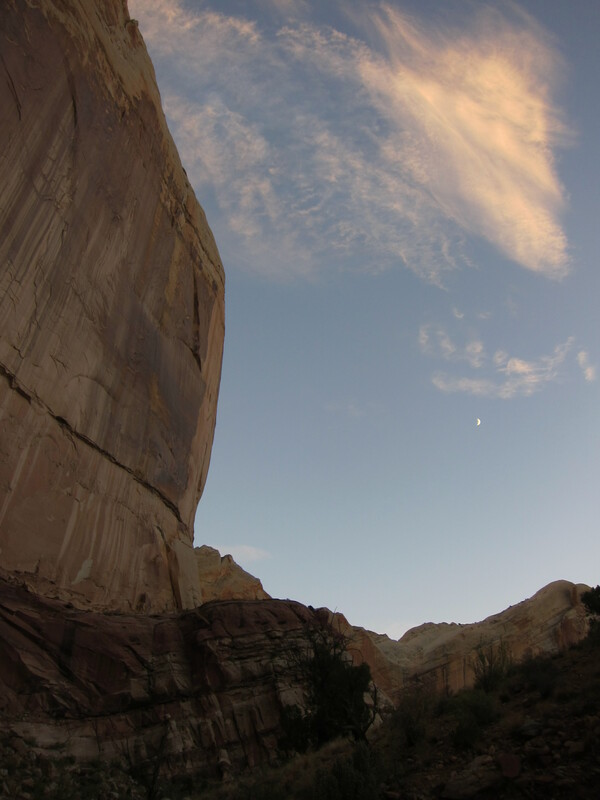 I love the Escalante. Thanks for posting. 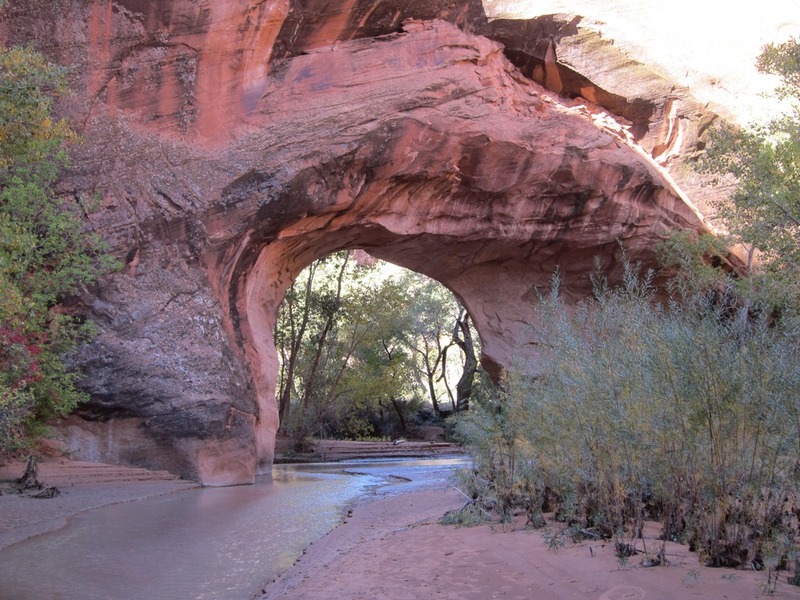 Awesome Adventure…..I hope to do this trip with my 13 year old daughter next Spring.